Check box if any part of the fee is offset as provided by Exchange Act Rule 0-11(a)(2) and identify the filing for which the offsetting fee was paid previously. Identify the previous filing by registration statement number, or the Form or Schedule and the date of its filing. You are cordially invited to attend our 2019 Annual Meeting of Stockholders (our “Annual Meeting”) of SMTC Corporation (our “Company”) to be held at our offices located at 425 North Drive Melbourne, FL 32934 on Thursday, May 9, 2019, at 10:00 a.m., Eastern Daylight Time. Pursuant to the rules promulgated by the U.S. Securities and Exchange Commission (the “SEC”), we are providing each holder of our common stock, par value $0.01 per share, with our notice of our Annual Meeting (our “Notice”), a copy of our proxy statement (our “Proxy Statement”) pursuant to Section 14(a) of the Securities Exchange Act of 1934, as amended, and our Annual Report on Form 10-K for the fiscal year ended December 30, 2018, filed with the SEC on March 15, 2019 (our “Annual Report”, and collectively with our Notice and our Proxy Statement, our “Proxy Materials”). Details of the business to be conducted at our Annual Meeting are given in our Proxy Materials. You should read carefully our Proxy Materials that describes (i) the proposed nominees for directors, (ii) the appointment of our independent registered public accounting firm, (iii) the vote to approve the amendment to our certificate of incorporation to increase the number of authorized shares of our Common Stock from 26,000,000 to 38,750,000, (iv) the non-binding advisory vote to approve the compensation of our named executive officers, (v) the vote to approve the SMTC Corporation 2019 Incentive Plan, and (vi) other business as may properly come before our Annual Meeting and any adjournment or postponement thereof. Whether or not you plan to attend our Annual Meeting, and regardless of the number of shares you own, it is important that your shares be represented at our Annual Meeting. You are accordingly urged to vote via a toll-free telephone number, over the Internet, or by completing, signing, dating, and promptly returning the proxy card you received with our Proxy Materials (our “Proxy Card”). Instructions regarding all three (3) methods of voting are contained in our Proxy Card. If you vote and then decide to attend our Annual Meeting to vote your shares in person, you may still do so. Your proxy is revocable in accordance with the procedures set forth in our Proxy Materials. On behalf of our board of directors, I would like to express our appreciation for your continued interest in our Company. We look forward to seeing you at our Annual Meeting. To transact such other business as may properly come before our Annual Meeting and any adjournment or postponement thereof. The foregoing items of business are more fully described in our proxy statement (our “Proxy Statement”), which is attached to this notice of our Annual Meeting (our “Notice”) and made a part hereof. We are also sending each stockholder a copy of our Annual Report on Form 10-K for the fiscal year ended December 30, 2018, filed with the U.S. Securities and Exchange Commission on March 15, 2019 (together with our Notice and our Proxy Statement, our “Proxy Materials”). Our Board has fixed the close of business on March 27, 2019, as the record date for determining the stockholders entitled to receive this Notice and to vote at our Annual Meeting and any adjournment or postponement thereof. WHETHER OR NOT YOU EXPECT TO ATTEND OUR ANNUAL MEETING IN PERSON, YOU ARE URGED TO VOTE VIA A TOLL-FREE TELEPHONE NUMBER, OVER THE INTERNET, OR BY COMPLETING, SIGNING, DATING, AND PROMPTLY RETURNING THE PROXY CARD YOU RECEIVED WITH OUR PROXY MATERIALS (THE “PROXY CARD”). INSTRUCTIONS REGARDING ALL THREE (3) METHODS OF VOTING ARE CONTAINED ON THE PROXY CARD. IF YOU VOTE AND THEN DECIDE TO ATTEND OUR ANNUAL MEETING TO VOTE YOUR SHARES IN PERSON, YOU MAY STILL DO SO. YOUR PROXY IS REVOCABLE IN ACCORDANCE WITH THE PROCEDURES SET FORTH IN OUR PROXY STATEMENT. SMTC Corporation, a Delaware corporation, is soliciting your proxy to vote your shares at our 2019 Annual Meeting of Stockholders to be held on Thursday, May 9, 2019, at 10:00 a.m., Eastern Daylight Time, our offices located at 425 North Drive Melbourne, FL 32934. Our proxy statement (our “Proxy Statement”) contains important information regarding our Annual Meeting. Specifically, it identifies the proposals on which you are being asked to vote, provides information that you may find useful in determining how to vote, and describes voting procedures. As permitted by the rules of the SEC, we are making notice of our Annual Meeting (our “Notice”), our Proxy Statement, and our Annual Report (collectively, our “Proxy Materials”) available to our Stockholders electronically via the Internet. On or about April, 4, 2019, we plan to mail to our Stockholders of record as of the close of business on March 27, 2019 (the “Record Date”), copies of our Proxy Materials. Instructions regarding how to vote your shares of Common Stock are included on the proxy card included with our Proxy Materials (our “Proxy Card”). You are accordingly urged to vote via a toll-free telephone number, over the Internet, or by completing, signing, dating, and promptly returning our Proxy Card. If you vote and then decide to attend our Annual Meeting to vote your shares in person, you may still do so. Your proxy is revocable in accordance with the procedures set forth in our Proxy Materials. Our Company will bear all attendant costs of the solicitation of proxies. Our Company will reimburse brokerage firms and other persons representing beneficial owners of shares for their expenses in forwarding solicitation materials to such beneficial owners. Proxies may be solicited by certain of our Company’s directors, officers, and regular employees, without additional compensation, personally or by telephone, facsimile, or email, or by a third party. Who may attend and vote? Our Board has fixed the close of business on March 27, 2019, as the Record Date for determining Stockholders entitled to receive our Notice and to vote at our Annual Meeting and any adjournment or postponement thereof. Each Stockholder as of the Record Date, is entitled to one (1) vote for each share of Common Stock owned as of the Record Date. On the Record Date, 23,353,558 shares of our Common Stock were issued and outstanding. At least ten (10) days before our Annual Meeting, we will make a complete list of Stockholders entitled to vote at our Annual Meeting open to the examination of any Stockholder for any purpose germane to our Annual Meeting at our offices located at 425 North Drive Melbourne, FL 32934. The list will also be made available to Stockholders present at our Annual Meeting. What is the difference between holding shares as a Stockholder of record and as a beneficial owner? Most Stockholders hold their shares through a broker, bank, or other nominee rather than directly in such Stockholder’s own name as the Stockholder of record. As summarized below, there are some distinctions between shares held of record and those owned beneficially. Stockholder of Record - If your shares are registered directly in your name with our transfer agent, Computershare LLC, you are considered, with respect to those shares, as the Stockholder of record. As the Stockholder of record, you have the right to grant your voting proxy directly to our Company or to vote in person at our Annual Meeting. Beneficial Owner - If your shares are held in a stock brokerage account or by a bank or other nominee, you are considered the beneficial owner of shares held in street name and your broker or nominee is considered, with respect to those shares, the Stockholder of record. As the beneficial owner, you have the right to direct your broker or nominee on how to vote those shares and are also invited to attend our Annual Meeting. However, since you are not the Stockholder of record, you may not vote these shares in person at our Annual Meeting unless you receive a proxy from your broker or nominee. Your broker or nominee has provided voting instructions for you to use to vote the shares of which you are the beneficial owner. If you wish to attend our Annual Meeting and vote in person, please contact your broker or nominee so that you can receive a legal proxy to present at our Annual Meeting. As a Stockholder, you have the right to vote on specified business matters affecting our Company. The proposals that will be presented at our Annual Meeting, and upon which you are being asked to vote, are discussed in the sections of our Proxy Statement beginning with “Proposal No. 1” and continuing to address each proposal as outlined in our Notice. Each share of our Common Stock you own entitles you to one (1) vote. By Mail—You may vote by mail by completing, signing, dating, and mailing our Proxy Card to: SMTC Corporation, 7050 Woodbine Avenue Markham, Ontario, Canada L3R 4G8. Telephone and Internet voting facilities for Stockholders of record will be available 24-hours-a-day and will close at 11:59 p.m. (EDT) on Wednesday, May 8, 2019. All Proxy Cards mailed to our Company must be received by Wednesday, May 8, 2019. If you vote by proxy, you enable the individuals named in your proxy to vote your shares at our Annual Meeting in the manner you indicate. We encourage you to vote by proxy even if you plan to attend our Annual Meeting. In this way your shares will be voted even if you are unable to attend our Annual Meeting. Your shares will be voted as you direct on your proxy, whichever way you choose to submit it. If you attend our Annual Meeting, you may deliver your completed Proxy Card in person or fill out and return a ballot that will be supplied to you. Beneficial Owners should follow voting instructions provided by their broker or nominee. What does the Board recommend? Our Board recommends that you vote “FOR” the election of the named Director nominees, “FOR” the ratification of the appointment of our independent registered public accounting firm, “FOR” the approval of the Charter Amendment to our Certificate of Incorporation, “FOR” a non-binding advisory vote for approval of the compensation of our named executive officers, and “FOR” the approval of the SMTC Corporation 2019 Incentive Plan. What vote is required for approval of each proposal? A majority of the shares of Common Stock, issued and outstanding and entitled to vote, present in person or represented by proxy, constitutes a quorum for the transaction of business at our Annual Meeting. The following votes are required for approval of the proposals. The five (5) candidates receiving the greatest number of affirmative votes (a “Plurality Vote”) of shares of Common Stock cast at our Annual Meeting will be elected. As the vote on this proposal is a “non-routine” matter under applicable rules, your bank, broker, or other nominee cannot vote on this matter without instructions from you. The number of votes of shares of Common Stock cast at our Annual Meeting in favor of Proposal No. 2 must exceed the number of votes of shares of Common Stock cast in opposition to Proposal No. 2 for Proposal No. 2 to pass. As the vote on this proposal is a “routine” matter under applicable rules, your bank, broker, or other nominee may vote on this matter in the absence of contrary instructions from you. The affirmative vote of the holders of a majority of the voting power of our outstanding Common Stock is required to approve Proposal No. 3. As the vote on this proposal is a “routine” matter under applicable rules, your bank, broker, or other nominee may vote on this matter in the absence of contrary instructions from you. The affirmative vote of a majority of the votes of shares of Common Stock cast at our Annual Meeting is required. Please note that while our Board intends to carefully consider the Stockholder vote on the executive compensation paid to our named executive officers, the vote is not binding on our Company and is advisory in nature. As the vote on this proposal is a “non-routine” matter under applicable rules, your bank, broker, or other nominee cannot vote on this matter without instructions from you. The affirmative vote of a majority of the votes of shares of Common Stock cast at our Annual Meeting is required. As the vote on this proposal is a “non-routine” matter under applicable rules, your bank, broker, or other nominee may not vote on this matter in the absence of contrary instructions from you. An automated system administered by our transfer agent will tabulate votes by proxy at our Annual Meeting, and an officer of our Company will tabulate votes cast in person at our Annual Meeting. What if I sign and return my Proxy Card without making any selection? If you sign and return your Proxy Card without making any selections, your shares of Common Stock will be voted as recommended by our Board. If other matters properly come before our Annual Meeting, the proxy holders will have the authority to vote on those matters for you at their discretion. As of the date of our Proxy Statement, we are not aware of any matters that will come before our Annual Meeting other than those disclosed in our Proxy Statement. What if I am a beneficial owner and I do not give the nominee voting instructions? Brokerage firms have the authority to vote shares for which their customers do not provide voting instructions on certain “routine” matters. A broker non-vote occurs when a nominee who holds shares of stock for another does not vote on a particular item, because the nominee does not have discretionary voting authority for that item and has not received instructions from the owner of the shares of stock. Broker non-votes are included in the calculation of the number of votes considered to be present at our Annual Meeting for purposes of determining the presence of a quorum, but broker non-votes are not counted as shares of stock present and entitled to be voted with respect to a matter on which the nominee has expressly not voted. Other than Proposal No. 1, Proposal No. 4 and Proposal No. 5, all of the proposals described in our Proxy Statement relate to “routine” matters. As a result, without your voting instructions, a broker will be able to vote your shares with respect to Proposal Nos. 2 and 3, but will not be able to vote your shares of stock with respect to Proposal Nos. 1, 4 or 5. What if I abstain or withhold authority to vote on a proposal? On Proposal No. 1, if you sign and return your Proxy Card marked “ABSTAIN” or withhold authority to vote, your shares of Common Stock will have no effect on the outcome of the election of Directors, because Directors are elected by a plurality of the votes cast. On Proposal No. 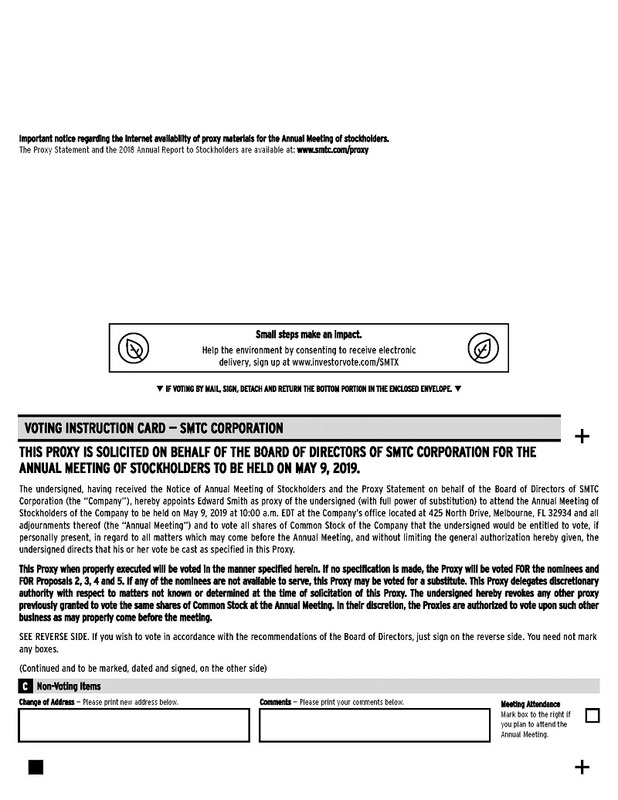 2, if you sign and return your proxy marked “ABSTAIN” or you withhold authority to vote, your shares of Common Stock will not be voted on that proposal and will not be counted as votes cast with regard to that proposal and, accordingly, will have no effect on the voting on the approval of the ratification of our independent registered public accounting firm. On Proposal No. 3, if you sign and return your proxy marked “ABSTAIN” or withhold authority to vote, it will have the same effect as a vote “AGAINST” the proposal, because Proposal No. 3 requires the affirmative vote of a majority of the voting rights of our issued and outstanding Common Stock. On Proposal Nos. 4 and 5, if you sign and return your proxy marked “ABSTAIN” or you withhold authority to vote, your shares of Common Stock will not be voted on those proposals and will not be counted as votes cast with regard to those proposals and, accordingly, will have no effect on the voting on (i) a non-binding, advisory basis, regarding the compensation of our named executive officers or (ii) the approval of the SMTC Corporation 2019 Incentive Plan. What does it mean if I receive more than one (1) Proxy Card? If you receive more than one (1) Proxy Card, it means that you hold shares of our Common Stock in more than one (1) account. To ensure that all of your shares of Common Stock are voted, sign and return each Proxy Card. Alternatively, if you vote by telephone or via the Internet, you will need to vote once for each Proxy Card you receive. May I change my proxy? Yes, a proxy may be revoked by the Stockholder giving the proxy, at any time before it is voted, by delivering a written notice of revocation to our Company at its principal executive offices (7050 Woodbine Avenue, Markham, Ontario, Canada L3R 4G8) prior to our Annual Meeting, and a prior proxy is automatically revoked by a Stockholder giving a subsequent proxy or attending and voting at our Annual Meeting. To revoke a proxy previously submitted by telephone or through the Internet, you may simply vote again at a later date, using the same procedures, in which case your later-submitted vote will be recorded and your earlier vote revoked. Attendance at our Annual Meeting in and of itself does not revoke a prior proxy. The number of authorized Directors on our Board is currently fixed at five (5). Our Directors are elected on an annual basis. Our Board is currently composed of the following Directors: Clarke H. Bailey, David Sandberg, Frederick Wasserman, J. Randall Waterfield, and Edward Smith, whose terms will expire upon the election and qualification of Directors at our Annual Meeting. The following table sets forth certain information with respect to each of the five (5) nominees for election as a Director of our Company. Each nominee was proposed for election by the nominating and corporate governance committee of our Board (our “Nominating and Corporate Governance Committee”) for consideration by our Board and proposal to our Stockholders. The ages shown are as at March 27, 2019, the date on which we filed our Proxy Statement with the SEC. Mr. Bailey joined our Board of Directors in June 2011. Mr. Bailey served as executive chairman (“Executive Chairman”) and interim Chief Financial Officer (“CFO”) of our Company from May 2013 to April 2014. Mr. Bailey is presently the Chairman and Chief Executive Officer (“CEO”) of EDCI Holdings, Inc., a holding company, a position held since 2009. In addition to his position at EDCI, he serves as a director of Iron Mountain Incorporated where he has served since 1998 and is currently Chairman of its risk and safety committee. Previously, Mr. Bailey served as the Chairman and CEO of Arcus, Inc. until 1998 and as managing director and head of the Principal Investment Group at Oppenheimer & Co. until 1990. Mr. Bailey has also previously served as a director on four (4) other public company boards, five (5) private company boards, and three (3) non-profit boards of trustees. Our Board believes that his significant experience in manufacturing, finance, and M&A, and serving as a CEO and on both public and private boards, make him well-qualified to serve as a director. Mr. Sandberg joined our Board of Directors in April 2009. Mr. Sandberg is the managing member of Red Oak Partners, LLC, which he founded in March 2003. He is also the portfolio manager of various funds managed by Red Oak Partners. Previously, Mr. Sandberg co-managed JH Whitney & Co’s Green River Fund, where he was employed from 1998 to 2002. Mr. Sandberg serves as the chairman of the board of directors of Asure Software, Inc. and Cord Blood America, Inc., both of which are public companies. He also served as a director of Issuer Direct Corporation, a public company, and WTI Holdings, LLC, a private company. Mr. Sandberg has also served as a director of the public companies EDCI, Inc., RF Industries, Ltd., and Planar Systems, Inc. Mr. Sandberg has experience serving as a member of and as chairman of each of the audit, compensation, nominating and governance, and strategic committees for public companies. He received a B.A. in Economics and a B.S. in Industrial Management from Carnegie Mellon University in 1994. Red Oak Partners, LLC is the largest Stockholder of our Company. Our Board believes that Mr. Sandberg’s experience serving as director on other public companies, as well has his experience in finance and public company capital market transactions, make him well-qualified to serve as a director. Mr. Wasserman joined our Board of Directors in August 2013. Mr. Wasserman is a seasoned executive who has forty (40) years of business experience helping to create stockholder value with a number of companies. Mr. Wasserman has been the president (“President”), Chief Operating Officer (“COO”), and CFO for a number of companies, including Mitchell & Ness Nostalgia Company where he was CFO and COO. He also served as President and CFO of Goebel of North America. Mr. Wasserman is currently, and has been since 2008, the President of FGW Partners LLC as well as the Chief Compliance Officer of Wynnefield Capital, Inc., a Stockholder of our Company. He served on the board of directors for National Holdings Corporation from October 2013 to September 2016. Mr. Wasserman currently serves as a member of the board of directors of Marker Therapeutic, Inc. (formerly known as Tapimmune Inc.), a position held since January 2016, MAM Software Group, Inc., MAM Software Group, Inc., and DLH Holdings Corp., each of which is a publicly-traded company. Our Board believes that Mr. Wasserman’s experience serving as a director on publicly-traded companies and his significant management experience make him well-qualified to serve as a director. Mr. Waterfield joined our Board of Directors in April 2012. Mr. Waterfield is the chairman of Waterfield Group, a diversified financial services holding company that traces its origins back to 1928. After selling the largest private mortgage company in the US and largest Indiana-based bank in 2006 and 2007, respectively, Waterfield Group has diversified into technology, real estate, asset management, and merchant banking. Mr. Waterfield holds the Chartered Financial Analyst designation, and is the 2017-18 chairman of the board of directors of YPO, a member of Mensa, and a graduate of Harvard University. Also, Mr. Waterfield currently serves on the board of directors of Waterfield Group and its affiliates, Environmental Risk Transfer and Asure Software Inc. Previously, Mr. Waterfield was an equity research analyst at Goldman Sachs & Co. from 1996 through 1999, where he was primarily responsible for small capitalization growth portfolios. Our Board believes that Mr. Waterfield’s experience in finance and M&A make him well-qualified to serve as a director. Mr. Smith joined our Company and Board of Directors in February 2017. He currently serves as our Company’s President and CEO, a position he has held since May 2017. From February 2017 to May 2017, Mr. Smith served as interim President and CEO of our Company. Mr. Smith has extensive experience in the electronic manufacturing services (“EMS”) industry and the electronic components distribution industry. Currently, he serves as a member of the board of advisors of Zivelo, Inc., a position he has held since 2015. Most recently, Mr. Smith served as senior vice president (“SVP”) of Global Embedded Solutions at Avnet, Inc. during 2016 and as President of Avnet Electronics Marketing Americas from February 2009 to March 2016. Mr. Smith worked in many positions during his tenure at Avnet, Inc., which began in 1994. From 2002 to 2004, Mr. Smith served as President and CEO of SMTEK International, Inc., a tier II manufacturer in the EMS industry. From 2009 to 2017, Mr. Smith served as a member of the Electronic Components Industry Association. Mr. Smith is also the founder and CEO of We Will Never Forget Foundation, Inc., a nonprofit organization that supports first responders through gifts to other charitable organizations. Our Board believes that Mr. Smith’s extensive experience in the EMS industry and as an executive officer of various other companies, make him well-qualified to serve as a director. The election of each Director requires the affirmative “FOR” Plurality Vote of the shares of Common Stock properly cast at our Annual Meeting for the election of Directors. Without voting instructions from you, your broker will not be able to vote your shares of stock with respect to Proposal No 1. Thus, broker non-votes and abstentions are not deemed to be votes cast and, therefore, have no effect on the outcome of the proposal. OUR BOARD RECOMMENDS A VOTE “FOR” THE ELECTION OF EACH OF THE NOMINEES NAMED ABOVE. The audit committee of our Board (our “Audit Committee”) has approved the engagement of PricewaterhouseCoopers LLP (“PwC LLP”) as our independent registered public accounting firm for the fiscal year ending December 29, 2019. In the event that our Stockholders do not ratify this appointment, our Audit Committee will reconsider whether to retain PwC LLP and may retain PwC LLP or another firm without resubmitting the matter to our Stockholders for ratification. Even if the appointment is ratified, our Audit Committee may, in its discretion, direct the appointment of a different independent registered public accounting firm at any time during the year if our Audit Committee determines that such change would be in our best interests and in the best interests of our Stockholders. We expect that representatives from PwC LLP will be present or available telephonically at our Annual Meeting and will be available to respond to appropriate questions and have the opportunity to make a statement if they desire. Set forth below are the fees incurred by our Company to our independent registered public accounting firm, PwC LLP, for the fiscal years indicated. The amounts are presented in USD and converted using average twelve-month exchange rate of USD $1.00 to CAD $1.29 and USD $1.00 to CAD $1.30 for fiscal years 2018 and 2017, respectively. Audit Fees — consists of fees for professional services rendered in connection with the audit of our annual financial statements, the review of our interim financial statements included in our quarterly reports on Form 10-Q, and other services provided in connection with statutory and regulatory filings. Tax Fees — consists of fees for professional services related to tax compliance, planning, and consulting services. Our Audit Committee’s charter provides that our Audit Committee will pre-approve all audit services and non-audit services to be provided by our independent registered public accounting firm before our independent registered public accounting firm is engaged to render these services. Our Audit Committee has considered whether our independent registered accounting firm’s provision of non-audit services is compatible with its independence. In April 2004, our Board adopted an Audit and Non-Audit Services Pre-Approval Policy for our Audit Committee. Under this policy, our Audit Committee has pre-approved certain audit and audit-related services, tax services, and other services. Our Audit Committee has determined that the provision of those services that are pre-approved in compliance with this policy will not impair the independence of our independent registered public accounting firm. The provision of services by our independent registered public accounting firm that are not pre-approved in compliance with this policy are subject to separate pre-approval by our Audit Committee. This policy also pre-approved specified fee levels for the specific services. Payments exceeding these specified fee levels are subject to separate pre-approval by the Audit Committee. All audit and non-audit services performed by our independent registered public accounting firm during 2018 were pre-approved by our Audit Committee to assure that such services did not impair our independent registered public accounting firm’s independence from our Company. The affirmative “FOR” vote of a majority of shares of Common Stock cast at our Annual Meeting is required to ratify the appointment of PwC LLP as our independent registered public accounting firm for the fiscal year ending December 29, 2019. Without voting instructions from you, your broker will be able to vote your shares with respect to Proposal No. 2. Abstentions are not deemed to be votes cast and, therefore, have no effect on the outcome of this proposal. OUR BOARD RECOMMENDS A VOTE “FOR” THE RATIFICATION OF PWC LLP AS OUR INDEPENDENT REGISTERED PUBLIC ACCOUNTING FIRM FOR THE FISCAL YEAR ENDING DECEMBER 29, 2019. On March 13, 2019, our Board approved the Charter Amendment to our Certificate of Incorporation to increase the number of authorized shares available for issuance under our Certificate of Incorporation. Currently, our Certificate of Incorporation provides that we may issue up to 31,000,000 shares of Common Stock, consisting of 26,000,000 shares of Common Stock and 5,000,000 shares of preferred stock, par value $0.01 per share (our “Preferred Stock”). The Charter Amendment to our Certificate of Incorporation would increase the total number of authorized shares of capital stock available for issuance by our Company to 43,750,000 shares, consisting of 38,750,000 shares of Common Stock and 5,000,000 shares of Preferred Stock. If the Charter Amendment is adopted, the certificate of amendment giving effect to the Charter Amendment (our “Certificate of Amendment”) would be filed as soon as practicable. All of the designations, power, privileges, rights, qualifications, limitations, and restrictions of our Common Stock and our Preferred Stock would remain the same. The approval of the Charter Amendment to our Certificate of Incorporation to increase the number of shares of our authorized capital stock, is to provide flexibility to the Company with respect to stock issuances. We are therefore requesting our Stockholders to approve the Charter Amendment to our Certificate of Incorporation to facilitate the growth of our Company. We currently have no commitments or understandings with respect to the issuance of any of the additional shares of Common Stock or Preferred Stock that would be authorized by the proposed Charter Amendment. The affirmative “FOR” vote of a majority of the outstanding shares of Common Stock is required to approve the Charter Amendment to our Certificate of Incorporation. Without voting instructions from you, your broker will be able to vote your shares with respect to Proposal No. 3. Abstentions will have the same effect as a vote “AGAINST” the proposal, because Proposal No. 3 requires the affirmative vote of a majority of the voting rights of our issued and outstanding Common Stock. OUR BOARD RECOMMENDS A VOTE “FOR” THE APPROVAL OF THE CHARTER AMENDMENT TO OUR CERTIFICATE OF INCORPORATION. Unless our Board revises its policy on the frequency of future advisory votes, the next advisory vote on the compensation of our Company’s named executive officers will be held at the 2020 Annual Meeting of Stockholders. Although this vote is advisory and not binding on our Company, the compensation and management development committee of our Board (our “Compensation and Management Development Committee”) and our Board will take into account the outcome of the vote when considering future executive compensation decisions. To be effective, the proposal needs to be approved by the affirmative “FOR” vote of a majority of the shares of Common Stock cast at our Annual Meeting. Without voting instructions from you, your broker will not be able to vote your shares of stock with respect to Proposal No 4. Thus, broker non-votes and abstentions are not deemed to be votes cast and, therefore, have no effect on the outcome of the proposal. OUR BOARD RECOMMENDS A VOTE “FOR” THE APPROVAL OF THE COMPENSATION OF OUR COMPANY’S NAMED EXECUTIVE OFFICERS. Our Board, upon the recommendation of our Compensation and Management Development Committee, unanimously approved the adoption of the SMTC Corporation 2019 Incentive Plan (the “2019 Plan”) on March 13, 2019 and is now asking our Stockholders to approve the 2019 Plan. The 2019 Plan, if approved by our Stockholders, will become effective on the date of Stockholder approval and will replace the SMTC Corporation 2010 Incentive Plan (the “2010 Plan”). The 2019 Plan will be terminated for new grants effective as of the date of Stockholder approval of the 2019 Plan. The 2010 Plan is otherwise set to expire on July 27, 2020. Our Board, our Compensation and Management Development Committee, and our management believe that the effective use of long-term equity incentive compensation is vital to our continued ability to attract, retain, and motivate the individuals necessary to successfully execute our business plan, achieve strong performance, and further align the interests of such individuals with those of our Stockholders. If approved by our Stockholders, 3,000,000 shares of our Common Stock will be authorized for issuance under the 2019 Plan, subject to adjustment for certain changes in our corporate or capital structure set forth in the 2019 Plan. Upon Stockholder approval of the 2019 Plan, any remaining shares of Common Stock available for issuance as new awards under the 2010 Plan will cease to be issuable under the 2010 Plan and will not be added to the share reserve under the 2019 Plan. As of March 27, 2019, 1,292,858 shares of Common Stock remain available for issuance as new awards under the 2010 Plan, but the Company will not issue any of these remaining shares under the 2010 Plan prior to the Annual Meeting or, subject to Stockholder approval of the 2019 Plan, any time thereafter. New grants will be made only under the 2019 Plan if approved by Stockholders. Our Board believes the share reserve under the 2019 Plan is reasonable and prudent to allow us make equity grants in the future, so that we may respond to growth and market competition and motivate superior results with long-term, performance-based incentives. In the determining the size of the share reserve under the 2019 Plan, the Company considered the historical three-year average burn rate under the 2010 Plan, the increased potential dilution to Stockholders and the desire to grant appropriate levels of awards to our employees, directors and other eligible service providers to attract, retain and motivate such individuals. The number of shares of Common Stock reserved under the 2019 Plan represents approximately 12.8% of the total number of shares of Common Stock outstanding on March 27, 2019. If Stockholders approve the 2019 Plan, the total number of shares of Common Stock reserved under the 2019 Plan, plus the number of shares subject to outstanding awards under the 2010 Plan as of March 27, 2019, is 4,913,024 shares of Common Stock, which represents 21.0% of the total number of shares of Common Stock outstanding on March 27, 2019. No shares remaining available for new grants under the 2010 Plan as of March 27, 2019 will be issued as new awards prior to the Annual Meeting, and those shares will not be added to the 2019 Plan. On March 26, 2019, the last reported sales price of our Common Stock on the NASDAQ Capital Market was $3.83 per share. If our Stockholders do not approve of the 2019 Plan, the 2010 Plan will remain outstanding in accordance with its terms. No Evergreen Provision. Unlike the 2010 Plan, the 2019 Plan does not contain an “evergreen” or automatic replenishment provision pursuant to which shares of Common Stock authorized for issuance under the 2019 Plan are automatically replenished each year. No Share Recycling for Net Exercises or Tax Withholding. Shares of Common Stock withheld or tendered to pay either the exercise price of an award or taxes under an award do not become available for issuance as future awards under the 2019 Plan. No Automatic Vesting upon a Change in Control. No automatic accelerated vesting upon a change in control. No Liberal “Change in Control” Definition. A change in control transaction must actually occur in order for the change in control provisions in the 2019 Plan to be triggered. No Repricing of Options. The 2019 Plan prohibits the repricing or cashing-out of stock options that have exercise prices above the current fair market value of the Common Stock without Stockholder approval. No Discounted Stock Options. Stock options may not be granted with exercise prices less than the fair market value of the Common Stock on the grant date (with exceptions for options we assume in acquisitions of other companies). No Dividends on Options or Unvested Awards. Options are not eligible to receive dividends or dividend equivalents. Dividends or dividend equivalents on other awards, if paid, are paid only if the underlying award vests. Limits on Non-Employee Director Equity and Cash Compensation. The 2019 Plan limits the value of equity and cash awards that may be awarded to a non-employee Director in any single calendar year. Forfeiture/Claw Back. Awards granted under the 2019 Plan will be subject to recoupment in accordance with any claw back policy that our Company is required to adopt under the Dodd-Frank Wall Street Reform and Consumer Protection Act, other applicable law, or any other policy we may adopt. The following is a summary of the material features of the 2019 Plan. This summary neither contains all information about the 2019 Plan nor purports to be a complete description of the 2019 Plan. A copy of the complete text of the 2019 Plan is attached to our Proxy Statement as Appendix A, and the following description is qualified in its entirety by reference to Appendix A. The purpose of the 2019 Plan is to attract, retain, and motivate our employees, officers, Directors, consultants, agents, advisors, and independent contractors by providing them with the opportunity to acquire an equity interest in our Company and to align their interests and efforts to the long-term interests of our Stockholders. Our Board and our Compensation and Management Development Committee is authorized to administer the 2019 Plan. Our Board or our Compensation and Management Development Committee may delegate concurrent administration of the 2019 Plan to different committees consisting of one (1) or more members of our Board or to one (1) or more officers in accordance with the 2019 Plan’s terms and applicable law. The Administrator (as defined below) is authorized to select the individuals to be granted awards and to determine the types of awards to be granted, the number of shares of Common Stock subject to awards, and the other terms, conditions, and provisions of such awards, subject to the 2019 Plan’s terms. References to the “Administrator” are, as applicable, to our Board, our Compensation and Management Development Committee, or any other committee or officers who may be authorized to administer the 2019 Plan. Awards may be granted under the 2019 Plan to our employees, officers, Directors, consultants, agents, advisors and independent contractors and those of our subsidiaries. As of December 30, 2018, we had approximately 3,291 U.S. and non-U.S. employees of which 2,758 were full time and contract employees, all of whom would be eligible to participate in the 2019 Plan. However, consistent with prior year’s practice, we do not intend to make grants to all such individuals. The 2019 Plan authorizes the issuance of up to 3,000,000 shares of Common Stock. In addition, shares of Common Stock subject to outstanding options and restricted stock units under the 2010 Plan as of the date of Stockholder approval of the 2019 Plan, which subsequently cease to be subject to such awards (other than by reason of exercise or settlement of the awards in vested or nonforfeitable shares), will become available for grant under the 2019 Plan, up to a maximum of 1,913,024 shares of Common Stock subject to such awards as of March 27, 2019. However, shares that are issued under the 2010 Plan upon exercise or settlement of awards outstanding under that plan will not become available for issuance under the 2019 Plan. Also, any shares of Common Stock remaining for issuance as new awards under the 2010 Plan as of the date of Stockholder approval of the 2019 Plan will not be added to the share reserve under the 2019 Plan. The Company will not make any additional grants under the 2010 Plan prior to the date of the Annual Meeting. Shares of Common Stock subject to awards that lapse, expire, terminate, or are canceled prior to the issuance of the underlying shares of Common Stock will be available again for issuance under the 2019 Plan. shares of Common Stock subject to an award that is settled in cash or in another manner where some or all of the shares of Common Stock covered by the award are not issued. Awards granted in assumption of or in substitution for previously granted awards by an acquired company will not reduce the number of shares of Common Stock authorized for issuance under the 2019 Plan. A maximum of 3,000,000 shares of Common Stock may be issued upon the exercise of incentive stock options under the 2019 Plan. Shares of Common Stock will be issuable under the 2019 Plan to the extent such shares of Common Stock may be issued in compliance with our Certificate of Incorporation, as amended from time to time. Subject to certain adjustments for changes in our corporate or capital structure described below, participants may not be granted equity awards under the 2019 Plan in any single calendar year for more than 1,000,000 shares. Notwithstanding the foregoing paragraph, the maximum value of equity awards and cash compensation that a non-employee Director may receive in a single calendar year is $500,000. For equity awards, the amount is computed based on the grant date fair value of such awards in accordance with applicable financial accounting rules. If any change to our Common Stock occurs by reason of a stock dividend, stock split, spin-off, recapitalization, merger, consolidation, combination or exchange of shares, distribution to Stockholders other than a normal cash dividend, or other change in our corporate or capital structure, the Administrator will make proportional adjustments to the maximum number and kind of securities (i) available for issuance under the 2019 Plan (including pursuant to any per-participant limits thereunder), (ii) issuable as incentive stock options, and (iii) subject to any outstanding award, including the per share price of such securities. Subject to the 2019 Plan, the Administrator is authorized to make the foregoing adjustments in the event of any distribution of assets or cash to Stockholders other than a normal cash dividend or similar event in a manner intended to preserve the value of outstanding awards. Below we list the types of awards that may be granted under the 2019 Plan. The Administrator may grant either incentive stock options, which must comply with Section 422 of the Internal Revenue Code of 1986, as amended (the “Code”), or nonqualified stock options. The exercise price of stock options granted under the 2019 Plan must be at least equal to one hundred percent (100%) of the fair market value of the underlying Common Stock the grant date, except in the case of options assumed or substituted for in acquisition transactions. Unless the Administrator determines otherwise, fair market value means, as of a given date, the closing price of our Common Stock. Stock options have a maximum term of ten (10) years from the grant date, subject to earlier termination following a participant’s termination of employment or service relationship with us. The Administrator may grant SARs, either on a stand-alone basis or as a right in tandem with the grant of stock options. Upon exercise, SARs are the right to receive payment per share in stock or cash, or in a combination of Common Stock and cash, equal to the excess of the share’s fair market value on the date of exercise over its fair market value on the date the SAR was granted. Exercise of a SAR issued in tandem with a stock option will reduce the number of shares of Common Stock underlying the related stock option to the extent of the SAR exercised. The term of a stand-alone SAR cannot be more than ten (10) years, and the term of a tandem SAR cannot exceed the term of the related option. The Administrator may grant awards for restricted or unrestricted shares of stock or awards denominated in units of stock, such as restricted stock units, under the 2019 Plan. These awards may be made subject to repurchase or forfeiture restrictions at the Administrator’s discretion. The restrictions may be based on continuous service with us or the achievement of specified performance criteria, as determined by the Administrator. The Administrator may grant performance awards in the form of performance shares or performance units. Performance shares are units valued by reference to a designated number of shares of stock, and performance units are units valued by reference to a designated amount of property other than shares of stock. Both types of awards may be payable in stock, cash, or other property, or a combination thereof, upon the attainment of performance criteria and other terms and conditions as established by the Administrator. The Administrator may grant other incentives payable in cash or in shares of Common Stock, subject to the terms of the 2019 Plan, and any other terms and conditions determined by the Administrator. The Administrator may not reduce the exercise price of a stock option or stock appreciation right or take any other action that is treated as a repricing under generally accepted accounting principles without Stockholder approval. Awards may be conditioned on the satisfaction of specified performance criteria determined by the Administrator that may be measured absolutely or by reference to an index or indices and determined either on a consolidated basis, or as the context permits, on a divisional, subsidiary, line of business, project or geographical basis or in combinations thereof. Performance criteria may include, but are not limited to, measures based on: sales; revenues; assets; expenses; earnings before or after deductions for all or any portion of interest, taxes, depreciation, or amortization, whether or not on a continuing operations or an aggregate or per share basis; return on equity, investment, capital, or assets; one (1) or more operating ratios; borrowing levels, leverage ratios or credit rating; market share; capital expenditures; cash flow; stock price; Stockholder return; sales of particular products or services; customer acquisition or retention; acquisitions and divestitures (in whole or in part); joint ventures and strategic alliances; spin-offs, split-ups, and the like; reorganizations; or recapitalizations, restructurings, financings (issuance of debt or equity) or refinancings. Awards generally may not be transferred, except by will or the laws of descent and distribution, unless the Administrator permits a transfer by gift or for family estate planning purposes. Outstanding awards may be converted, assumed, substituted for, or replaced by a successor company. In such event, vesting will continue for outstanding awards that vest based on continued employment or service and all restrictions or forfeiture provisions applicable to such awards will not lapse. If and to the extent outstanding awards are not converted, assumed, substituted for, or replaced by a successor company or the transaction is one in which awards could not be converted, assumed, substituted for or replaced, the awards will terminate at the effective time of the Covered Transaction. The Administrator, in its sole discretion, may determine whether awards will accelerate in vesting in whole or in part, or if applicable restrictions or forfeiture provisions will lapse in whole or in part, immediately prior to the Covered Transaction. All performance shares, performance units, and other performance-based awards will be prorated based on targeted performance being attained as of the effective date of the Covered Transaction and will be paid in accordance with the payout schedule for the award. Alternatively, outstanding awards may be terminated and in exchange therefor, participants will receive a cash payment equal to the difference between the per share consideration received by holders of Common Stock in the transaction and the per share exercise price (either only to the extent vested at the time of the Covered Transaction or on a fully vested basis, as determined in the Administrator’s discretion). A “Covered Transaction” generally means (i) a consolidation or merger in which our Company is not the surviving corporation or which results in the acquisition of all or substantially all of our Common Stock by a person, entity, or by a group of persons or entities acting together, (ii) a change in the composition of our Board such that the members of our Board at the beginning of any consecutive 24-calendar-month period cease, for any reason other than due to death, to constitute at least a majority of the members of our Board (with an exception for new Directors elected or nominated for election during such period by at least a majority of the incumbent Directors), and (iii) a sale of all or substantially all of our assets. If our Company dissolves or liquidates, unless the Administrator determines otherwise, outstanding awards will terminate immediately prior to such dissolution or liquidation. Awards granted under the 2019 Plan are subject to recovery to the extent required by applicable law or any compensation recovery or claw back policy adopted by our Company. Our Board or our Compensation and Management Development Committee is permitted to amend the 2019 Plan or any outstanding award thereunder, except that only our Board may amend the 2019 Plan if Stockholder approval of the amendment is required by applicable law, regulation, or stock exchange rule. Amendment of an outstanding award generally may not materially adversely affect a participant’s rights under the award without the participant’s consent, subject to certain limited exceptions set forth in the 2019 Plan. Our Board or our Compensation and Management Development Committee may suspend or terminate all or any portion of the 2019 Plan prior to its expiration date at any time, but in such event, outstanding awards will remain outstanding in accordance with their existing terms and conditions. Unless sooner terminated by our Board or the Compensation and Management Development Committee, the 2019 Plan will terminate on March 13, 2029. All future awards to employees, officers, Directors, and consultants under the 2019 Plan are made at the discretion of the Administrator. Therefore, the future benefits and amounts that will be received or allocated to such individuals under the 2019 Plan are not determinable at this time. Please see the summary of outstanding awards held by our named executive officers as of December 30, 2018 provided in “Outstanding Equity Awards at Fiscal Year-End” on page 27 of our Proxy Statement for more information. Please see “Compensation of Directors” on page of our 22 Proxy Statement for more information on grants made to our non-employee Directors in the last fiscal year. In 2018, awards for 335,929 shares of Common Stock were granted to our executive officers as a group (three (3) persons), and awards for 75,000 shares were granted to employees other than executive officers as a group. The following is a summary of the U.S. federal income tax consequences of the 2019 Plan generally applicable to us and to participants in the 2019 Plan who are subject to U.S. federal taxes. The summary is based on the Code, applicable Treasury Regulations, and administrative and judicial interpretations thereof, each as in effect on the date of this Proxy Statement and is, therefore, subject to future changes in the law, possibly with retroactive effect. The summary is general in nature and does not purport to be legal or tax advice. Furthermore, the summary does not address issues relating to any U.S. gift or estate tax consequences or the consequences of any state, local or foreign tax laws. A participant generally will not recognize taxable income upon the grant or vesting of a nonqualified stock option with an exercise price at least equal to the fair market value of the Common Stock on the date of grant and no additional deferral feature. When a nonqualified stock option is exercised, a participant generally will recognize compensation taxable as ordinary income in an amount equal to the difference between the fair market value of the shares of Common Stock underlying the option on the date of exercise and the option exercise price. When a participant sells the shares of Common Stock, the participant will have short-term or long-term capital gain or loss, as the case may be, equal to the difference between the amount the participant received from the sale and the tax basis of the shares sold. The tax basis of the shares generally will be equal to the greater of the fair market value of the shares on the exercise date or the option exercise price. A participant generally will not recognize taxable income upon the grant or vesting of an incentive stock option. If a participant exercises an incentive stock option during employment or within three (3) months after his or her employment ends (twelve (12) months in the case of permanent and total disability), the participant will not recognize taxable income at the time of exercise for regular U.S. federal income tax purposes (although the participant generally will have taxable income for alternative minimum tax purposes at that time as if the option were a nonqualified stock option). If a participant sells or otherwise disposes of the shares of Common Stock acquired upon exercise of an incentive stock option after the later of (i) one (1) year from the date the participant exercised the option and (ii) two (2) years from the grant date of the option, the participant generally will recognize long-term capital gain or loss equal to the difference between the amount the participant received in the disposition and the option exercise price. If a participant sells or otherwise disposes of shares of Common Stock acquired upon exercise of an incentive stock option before these holding period requirements are satisfied, the disposition will constitute a “disqualifying disposition,” and the participant generally will recognize taxable ordinary income in the year of disposition equal to the excess of the fair market value of the shares of Common Stock on the date of exercise over the option exercise price (or, if less, the excess of the amount realized on the disposition of the shares over the option exercise price). The balance of the participant’s gain on a disqualifying disposition, if any, will be taxed as short-term or long-term capital gain, as the case may be. With respect to both nonqualified stock options and incentive stock options, special rules apply if a participant uses shares of Common Stock already held by the participant to pay the exercise price. A participant generally will not recognize taxable income upon the grant or vesting of an SAR with a grant price at least equal to the fair market value of our Common Stock on the date of grant and no additional deferral feature. Upon the exercise of an SAR, a participant generally will recognize compensation taxable as ordinary income in an amount equal to the difference between the fair market value of the shares Common Stock underlying the SAR on the date of exercise and the grant price of the SAR. Upon receipt of a stock award that is not subject to forfeiture, vesting, or other similar restrictions, a participant generally will recognize compensation taxable as ordinary income in an amount equal to the excess of the fair market value of the shares of Common Stock at such time over the amount, if any, paid by the participant with respect to those shares. When a participant sells the shares of Common Stock, the participant generally will have short-term or long-term capital gain or loss, as the case may be, equal to the difference between the amount the participant received from the sale and the tax basis of the shares of Common Stock sold. The tax basis of the shares of Common Stock generally will be equal to the amount, if any, paid by the participant with respect to the shares of Common Stock plus the amount of taxable ordinary income recognized by the participant upon receipt of the shares of Common Stock. A participant generally will not have taxable income upon the grant of restricted stock, stock units (including restricted stock units), performance shares, or performance units. Instead, the participant generally will recognize ordinary income at the time of vesting or payout equal to the fair market value on the vesting or payout date, as applicable, of the shares of stock or cash received minus any amount paid. For restricted stock only, a participant may instead elect to be taxed at the time of grant if the participant makes a timely and proper Section 83(b) election for the award. In the foregoing cases, we generally will be entitled to a deduction at the same time, and in the same amount, as a participant recognizes ordinary income, subject to certain limitations imposed under the Code. We intend that awards granted under the 2019 Plan will comply with, or otherwise be exempt from, Code Section 409A, but we make no representation or warranty to that effect. We are authorized to deduct or withhold from any award granted or payment due under the 2019 Plan, or to require a participant to remit to us, the amount of any withholding taxes due in respect of the award or payment and to take such other action as may be necessary to satisfy all obligations for the payment of applicable withholding taxes. We are not required to issue any shares of Common Stock or otherwise settle an award under the 2019 Plan until all tax withholding obligations are satisfied. The affirmative “FOR” vote of a majority of shares of Common Stock cast at our Annual Meeting is required to approve the 2019 Plan. Without voting instructions from you, your broker will not be able to vote your shares with respect to Proposal No. 5. Abstentions are not deemed to be votes cast and, therefore, have no effect on the outcome of this proposal. OUR BOARD RECOMMENDS A VOTE “FOR” THE APPROVAL OF THE 2019 PLAN OF THE COMPANY. The 2010 Plan was adopted by the Board and approved by the Stockholders in July 2010. (1) The weighted average exercise price only applies to the 1,719,824 shares subject to outstanding stock options as there is no exercise price on the 357,377 outstanding RSUs. (2) In July 2010, the plan authorized an initial limit of 350,000 shares. In the years 2011 to 2015, the authorized number of shares increased by 1,944,022 under the 2010 Plan as approved by the Board of Directors and approved by the stockholders, in addition to annual increases authorized based on the evergreen annual increase formula of the 2010 Plan. In 2016, the Company’s stockholders approved an increase in the number of shares available for issuance under the 2010 Plan by 1,500,000 shares. The evergreen annual increases based on the formula of the 2010 Plan was 194,394 shares in 2017 and 193,807 shares in 2018. The total number of shares remaining available for future issuance under the 2010 Plan as of December 30, 2018 is 1,292,858. The number of authorized Directors on our Board is currently fixed at five (5). Our Board is currently composed of the five (5) Directors: Clarke H. Bailey, David Sandberg, J. Randall Waterfield, Frederick Wasserman, and Edward Smith. Edward Smith currently serves as our President and CEO. Mr. Smith was recommended for election to our Board in connection with this appointment as President and CEO. There are no family relationships between any of our Directors or executive officers Please see “Proposal No. 1 - Election of Directors” on page 6 of our Proxy Statement for more information on each of our Directors on our Board. During fiscal year 2018, our Board held fourteen (14) meetings, including regularly scheduled and special meetings. During fiscal year 2018, each of our Directors attended more than seventy-five percent (75%) of the total number of meetings of our Board and our committees on which such Director served. Our Company does not have a formal written policy specifying whether Directors must attend Stockholder meetings, however to the extent reasonably practicable, Directors are encouraged to attend Stockholder meetings in person or telephonically. Our entire Board attended our 2018 Annual Meeting. Our Board has three (3) standing committees: our Audit Committee, our Compensation and Management Development Committee and our nominating and governance committee (our “Nominating and Governance Committee”), each of which is described below. Each committee operates under a written charter that our Board adopted. All of the charters are publicly available on our website at www.smtc.com under the “Corporate Governance” link under the “Investor Relations” tab. You may also obtain a copy of our committee charters upon written request to our Investor Relations Department at our principal executive offices. Our Board has determined that each of Clarke H. Bailey, David Sandberg, J. Randall Waterfield, and Frederick Wasserman is an independent director (each, an “Independent Director”) as defined in the listing rules of the NASDAQ Stock Market (the “NASDAQ Rules”). Mr. Smith was not an Independent Director as defined in NASDAQ Rules. All Nominating and Governance Committee members are Independent Directors as defined in and as required by the NASDAQ Rules. All Audit Committee members are Independent Directors as defined in the NASDAQ Rules and Rule 10A-3(b)(1) under the Exchange Act, and as required by the NASDAQ Rules. All Compensation and Management Development Committee members are Independent Directors as defined in and as required by the NASDAQ Rules. Our Audit Committee is responsible for assisting our Board in fulfilling its responsibility to Stockholders, potential Stockholders, and the investment community in monitoring our accounting and reporting practices, systems of internal accounting and financial controls, our compliance with legal and regulatory requirements related to financial reporting, the qualifications and independence of our independent registered public accounting firm, the performance of our independent registered public accounting firm, and the quality and integrity of our financial reports. Our Audit Committee has the sole authority to retain and terminate our independent registered public accounting firm and is directly responsible for the compensation and oversight of the work of our independent registered public accounting firm. Our independent registered public accounting firm reports directly to our Audit Committee. Our Audit Committee reviews and discusses with our management and our independent registered public accounting firm the annual audited and unaudited quarterly financial statements, the disclosures in our annual and quarterly reports filed with the SEC, critical accounting policies and practices we use, our internal control over financial reporting, and our major financial risk exposures. Our Board has determined that Mr. Wasserman, who is currently the chairman of our Audit Committee, Mr. Sandberg, and Mr. Waterfield are each an “audit committee financial expert” as defined by the applicable rules of the SEC. Our Compensation and Management Development Committee is responsible for discharging our Board’s duties relating to oversight of executive compensation. This committee makes all decisions regarding the compensation of the executive officers with input and recommendations from our CEO (except with respect to compensation decisions for our CEO himself). Our Compensation and Management Development Committee is responsible for administering our executive compensation program, and reviews both short-term and long-term corporate goals and objectives with respect to the compensation of our CEO and our other executive officers. This committee also reviews and discusses, with our management, the impact of our compensation policies and practices on risk-taking within our Company. Our Compensation and Management Development Committee evaluates, at least once a year, the performance of our CEO and other executive officers in light of these goals and objectives and, based on these evaluations, approves the compensation of our CEO and our other executive officers. This committee also reviews and recommends to our Board incentive-compensation plans that are subject to our Board’s approval. During 2018, our Compensation and Management Development Committee utilized the services of a compensation consultant. As part of the 2018 compensation process, our Compensation and Management Development Committee retained Pay Governance LLC (“Pay Governance”) as its independent compensation consultant. Pay Governance provided advisory services only with respect to executive and equity compensation and a competitive assessment of compensation for our non-executives, in each case as directed by our Compensation and Management Development Committee. Pay Governance does no other business with our Company. Prior to engaging Pay Governance, our Compensation and Management Development Committee considered the independence of Pay Governance in accordance with the terms of the charter of our Compensation and Management Development Committee and applicable regulations. Our Compensation and Management Development Committee did not identify any conflicts of interest with respect to Pay Governance. Our Nominating and Governance Committee is composed solely of Independent Directors and participates in the search for qualified Directors. The criteria for selecting nominees for election as Directors of our Company includes experience in the operation of public companies, accomplishments, education, skills, and the highest personal and professional integrity. The candidate must be willing and available to serve and should generally represent the interests of all Stockholders, and not of any special interest group. After conducting an initial evaluation of a candidate, our Nominating and Governance Committee will interview that candidate if it believes the candidate may be suitable to be a Director and will also ask the candidate to meet with other Directors and management. If our committee believes a candidate would be a valuable addition to our Board, it will recommend to the full Board that candidate’s nomination for election to our Board. Our Nominating and Governance Committee does not have a formal written policy with regard to considering diversity in identifying nominees for Directors, but when considering Director candidates, the committee seeks individuals with backgrounds and skills that, when combined with those of our other Directors, bring a broad range of complementary skills, expertise, industry and regulatory knowledge, and diversity of perspectives to build a capable, responsive, and effective Board. Diversity considerations for a Director nominee may vary at any time according to the particular area of expertise being sought to complement the existing Board composition. Our Nominating and Governance Committee will consider candidates recommended by Stockholders. A Stockholder wishing to nominate a candidate should forward the candidate’s name and a detailed background of the candidate’s qualifications to our Secretary in accordance with the procedures outlined in our by-laws. Our Board has adopted a code of ethics and conduct (the “Ethics Code”), which is available on our website at www.smtc.com or in print without charge to any person who requests such document in writing. Any such request should be made to us at 7050 Woodbine Avenue, Markham, Ontario, Canada L3R 4G8 Attn: Chief Financial Officer. We intend to post any amendment to or waiver from the Ethics Code that requires disclosure under the SEC rules on its website. Our Board has provided a process by which our Stockholders or other interested parties can communicate with our Board or with our non-management Directors as a group. All such questions or inquiries should be directed to our President and CEO, Edward Smith, who can be reached at ed.smith@smtc.com. Mr. Smith will review and communicate pertinent inquiries to our Board or, if requested, our non-management Directors as a group. Our Board has previously determined that it was in the best interests of our Company and its Stockholders for separate individuals to serve as chair of our Board (“Chair”) and CEO, while recognizing that there may be circumstances in the future that would lead to the same individual serving in both capacities. Our Company believes this leadership structure has been the most appropriate for our Company, because our Board has been able to rely upon the experience and perspective Mr. Bailey has gained from serving both as a Director and while temporarily serving as our Company’s Executive Chairman and interim CFO during 2013 and 2014. Mr. Bailey fulfills his responsibilities as Chair through close interaction with management and all Directors. This structure ensures a greater role of Independent Directors in the active oversight of our business, including risk management oversight, and in setting agendas and establishing Board priorities and procedures. This structure also allows our CEO to focus, to a greater extent, on the management of our Company’s day-to-day operations. Our Board is responsible for consideration and oversight of the risks facing our Company. Our Board manages this oversight directly and through our Audit Committee and our Compensation and Management Development Committee. Our Board is kept informed by various reports provided to it on a regular basis, including reports made by our management at the meetings of our Board, our Audit Committee, and our Compensation and Management Development Committee. Our Audit Committee performs a central oversight role with respect to financial and compliance risks, which our Audit Committee then regularly reviews with our full Board. Our Compensation and Management Development Committee reviews and discusses with our management the impact of our compensation policies and practices on risk-taking within our Company. Our Board believes that our current leadership structure and the composition of our Board protect Stockholder interests and provide adequate independent oversight, while also providing outstanding leadership and direction for our Board and management. Section 16(a) of the Exchange Act requires our Directors, officers (as defined in Rule 16a-1 of the Exchange Act), and any persons who directly or indirectly hold more than ten percent (10%) of our Common Stock (“Reporting Persons”) to file reports of ownership and changes in ownership with the SEC on Forms 3, 4, and 5. Reporting Persons are required by SEC regulations to furnish our Company with copies of all Forms 3, 4, and 5 that they file. Based on our review of copies of such forms it has received from its Reporting Persons, the Reporting Persons met their Section 16(a) filing requirements in a timely manner during the fiscal year ended December 30, 2018. Independent Directors earn $40,000 per year for serving on our Board. The Chair of our Audit Committee earns an additional annual cash retainer of $10,000, the Chair of our Compensation and Management Development Committee earns an additional annual cash retainer of $7,000 and the Chair of our Nominating and Governance Committee earns an additional annual retainer of $3,000. The Chair of our Board may be awarded additional cash and equity compensation if circumstances warrant at the discretion of our Board. Annual equity compensation is also granted to our Independent Directors, with an aggregate grant date value of $20,000, which is issued in the form of stock options, restricted stock awards (“RSAs”), or restricted stock units (“RSUs”). Annual equity compensation is also provided to the Chair of our Board with an aggregate grant date value of $50,000, which is issued in the form of stock options, RSAs, or RSUs. We do not compensate Mr. Smith, our President and CEO, for his service on our Board. As directed by Mr. Sandberg, his cash compensation for the year ended December 30, 2018, was paid to Red Oak Partners, LLC (“ROP”). David Sandberg is the managing member of ROP. Stock awards issued to our Directors represented annual grants issued on December 12, 2018, in the form of RSAs. The RSAs have a forfeiture schedule if certain time-based service conditions are not met over a 12-month period in 2019. The amounts disclosed in this column represent the aggregate grant date fair value of the shares of Common Stock granted pursuant to the RSAs during the fiscal year computed in accordance with Financial Accounting Standards Board Accounting Standards Codification Topic 718 for stock-based compensation (“ASC 718”). The fair values of these shares of Common Stock granted pursuant to the RSAs were calculated based on assumptions summarized in Note 8 to our audited consolidated financial statements for the year ended December 30, 2018 included in our Annual Report. Notwithstanding anything to the contrary set forth in any of our prior filings under the Securities Act of 1933, as amended, or the Exchange Act, that might incorporate future filings, including our Proxy Statement, in whole or in part, the following report shall not be incorporated by reference into any such filings. Our Audit Committee of our Board currently consists of three Directors, Frederick Wasserman, David Sandberg, and J. Randall Waterfield. The duties of our Audit Committee are: (i) to review with our management and our independent registered public accounting firm the scope and results of any and all audits, the nature of any other services provided by our independent registered public accounting firm, the independence of our auditors, changes in the accounting principles applied to the presentation of our financial statements, and any comments by the independent registered public accounting firm on our policies and procedures with respect to internal accounting, auditing, and financial controls; (ii) to review the consistency and reasonableness of the financial statements contained in our quarterly and annual reports prior to filing them with the SEC (or with any other regulatory authority) and discuss the results of these quarterly reviews, annual audits, and any other matters required to be communicated with our independent registered public accounting firm under generally accepted auditing standards; and (iii) to select our independent registered public accounting firm and approve or pre-approve all auditing services and permitted non-audit services to be rendered by the auditor. Our Board has adopted a written charter for our Audit Committee, the sufficiency of which is evaluated each year by our Audit Committee. Consistent with its duties, our Audit Committee has reviewed and discussed with our management the audited financial statements for the fiscal year ended December 30, 2018. PwC LLP issued its unqualified report dated March 15, 2019, on our financial statements for the fiscal year ended December 30, 2018. Our Audit Committee has discussed with PwC LLP the matters required to be discussed by Auditing Standards No. 1301, “Communication with Audit Committees.” Also, our Audit Committee has received the written disclosures and the letter from PwC LLP required by Independence Standards Board Standard No. 1, “Independence Discussions with Audit Committees,” and has discussed with PwC LLP its independence as an auditor. Our Audit Committee concluded all meetings during fiscal year 2018 with an in-camera session. Based on these reviews and discussions, our Audit Committee recommended to our Board the inclusion of our audited financial statements for the fiscal year ended December 30, 2018, in our Annual Report. Our Company uses a combination of Company policies and established review procedures, including adherence to NASDAQ Rules, to ensure related person transactions are reviewed, approved, and ratified, as appropriate. We do not maintain these policies and procedures under a single written policy. Our Nominating and Corporate Governance Committee is responsible for considering and reporting to our Board any questions of possible conflicts of interest involving our Directors. Our Board is further required to meet the independence standards set forth in the NASDAQ Rules. Our Ethics Code, which applies to all of our Directors, officers, and employees, provides guidance on matters such as conflicts of interest and purchasing integrity, among others. We require that all of our Directors and officers complete a questionnaire annually. The questionnaire requires positive written affirmation regarding related person transactions that may constitute a conflict of interest, including: (i) any transaction or proposed transaction in excess of $120,000 involving our Director or officer or an immediate family member and our Company, a subsidiary, or any pension or retirement savings plan; (ii) any indebtedness to our Company; (iii) dealings with competitors, suppliers, or customers; (iv) any interest in real or personal property in which our Company also has an interest; and (v) the potential sale of any real or personal property or business venture or opportunity that will be presented to our Company for consideration. We review each questionnaire to identify any transactions or relationships that may constitute a conflict of interest, require disclosure, or affect an independence determination. For situations in which it is either clear that a conflict of interest exists or there is a potential conflict of interest, the related Director or officer is obligated to recuse himself from any discussion on the business arrangement. That Director or officer does not participate in the review and approval process for the related transaction. The compliance officer, together with our CEO or our Nominating and Corporate Governance Committee review transactions involving our Directors or officers that either clearly represent or may represent a conflict of interest. They determine whether these transactions are on terms that are as fair as if the transactions were on an arm’s length basis. If our compliance officer and our CEO or our Nominating and Corporate Governance Committee were to determine that a transaction is not on terms that are as fair as if it were on an arm’s length basis, the transaction would be modified such that the transaction has as fair as if it were on an arm’s length basis. There were no transactions required to be reported under Item 404(a) of Regulation S-K or that were required to be reviewed pursuant to above policies and procedures for fiscal year ended December 30, 2018. The following table sets forth, as of March 27, 2019, the number of shares beneficially owned and the percentage ownership for: (a) each person who is known by us to own beneficially more than five percent (5%) of our outstanding shares of Common Stock; (b) each of our named executive officer who is named in our summary compensation table and each of our current Director; and (c) all of our executive officers and current Directors as a group. As of March 27, 2019, our outstanding Common Stock consisted of 23,353,558 shares. Unless otherwise indicated below, to our knowledge, all persons listed below have sole voting and investment power with respect to their shares, and each entity or person listed below maintains a mailing address of c/o SMTC Corporation, 7050 Woodbine Avenue, Markham, Ontario, Canada L3R 4G8. The number of shares beneficially owned by each person is determined under rules promulgated by the SEC. Under these rules, beneficial ownership includes any shares as to which the person has sole or shared voting or investment power and any shares as to which the individual or entity has the right to acquire beneficial ownership of within sixty (60) days after March 27, 2019. *The number of shares of Common Stock deemed outstanding on March 27, 2019, with respect to a person or group includes (a) 23,353,558 shares outstanding on such date and (b) all options that are currently exercisable or will be exercisable within sixty (60) days of March 27, 2019, by the person or group in question. The Summary Compensation Table below provides information concerning the compensation of our named executive officers. During our 2018 annual meeting, our Stockholders approved the compensation of our named executive officers, which we described in our 2018 Proxy Statement, on a non-binding basis. Our Compensation and Management Development Committee considered the results of that non-binding vote when reviewing our compensation policies and practices for 2019. In the “Salary” column, we disclose the base salary paid to each of our named executive officers. Salaries are paid in U.S. dollars unless otherwise noted, consistent with the terms of any applicable employment agreements. In the “Option Awards” column, we disclose the aggregate grant date fair value of option awards granted and in the “Stock Awards” column, we disclose the aggregate grant date fair value of restricted stock units (“RSU”) awarded in the fiscal year, computed in accordance with ASC 718 without reduction for assumed forfeitures. The ASC 718 fair value of our stock options and RSUs are calculated based on assumptions summarized in Note 8 to our audited consolidated financial statements for the year ended December 30, 2018, and for which we recognize expense ratably over the vesting period. In the “Bonus” column, we disclose the amount earned as a performance based bonus for that particular fiscal year. In the column “All Other Compensation,” we disclose the sum of the dollar value of all other compensation that could not properly be reported in other columns of the Summary Compensation Table, including perquisites and amounts reimbursed for the payment of taxes. Mr. Smith was hired on February 6, 2017, and effective February 17, 2017, commenced as interim President and CEO of our Company. On May 15, 2017, Mr. Smith was appointed as President and CEO, removing the interim designation. Mr. Fitzgerald was hired effective June 5, 2017 as COO. Mr. Dunfield’s employment was terminated on May 2, 2018. Mr. Waszak was hired as SVP, mergers and acquisitions, on February 19, 2018 and appointed as CFO on March 13, 2018. The amounts disclosed in these columns represent the aggregate grant date fair value of option awards or RSUs, as applicable, granted during fiscal year computed in accordance with ASC 718. The fair values of these option awards and RSUs were calculated based on assumptions summarized in Note 8 to our audited consolidated financial statements for the year ended December 30, 2018, included in our Annual Report. Mr. Smith was granted 68,000 RSUs on February 17, 2017, with a grant date fair value of $100,000. The 68,000 RSUs vested on February 17, 2018. On May 15, 2017, Mr. Smith was granted 671,858 stock options with a strike price of $1.23 and will vest at twenty percent (20%) of the covered shares upon average closing share price of our Common Stock being above each of $2.00, $3.00, $4.00, $5.00, and $6.00 for a 90-day period. The fair value of the stock options was $0.28 per share and was calculated using the Cox, Ross, and Rubenstein binomial model (“Binomial Model”). Mr. Fitzgerald was granted 335,929 stock options on June 5, 2017, with a strike price of $1.26 and will vest at twenty percent (20%) of the covered shares upon the average closing share price of our Common Stock being above each of $2.00, $3.00, $4.00, $5.00, and $6.00 for a 90-day period. The fair value of the stock options was $0.28 per share and was calculated using the Binomial Model. Mr. Dunfield was granted 335,929 stock options on May 15, 2017, with a strike price of $1.23 and will vest at twenty percent (20%) of the covered shares upon the average closing share price of our Common Stock being above each of $2.00, $3.00, $4.00, $5.00, and $6.00 for a ninety 90-day period. The stock options fair value was $0.28 per share and was calculated using the Binomial Model. (iv) Mr. Waszak was granted 335,929 stock options on March 12, 2018 with a strike price of $2.07 and will vest at twenty percent (20%) of the covered shares upon the average closing share price of our Common Stock being above each of $2.50, $3.00, $4.00, $5.00, and $6.00 for a 90-day period. The fair value of the stock options was $0.47 per share and was calculated using the Binomial Model. Amounts disclosed for fiscal 2018 and 2017 represents the discretionary bonus earned by the officers as approved by our Board in addition to bonus earned from the short-term incentive plan. Amount disclosed as “All Other Compensation” represents the 2017 housing allowance paid to Mr. Smith as approved by our Board. The following table provides information regarding unexercised stock options and outstanding RSUs for each of our named executive officers outstanding as at December 30, 2018. (a) The number of securities for Mr. Smith, Mr. Waszak and Mr. Fitzgerald represent unvested stock options as at December 30, 2018. We have a tax-qualified 401(k) defined contribution retirement plan established for U.S. employees in which named executive officers may participate. Edward Smith, serves as our President and CEO. Please see “Proposal No. 1 - Election of Directors” on page 6 of our Proxy Statement for more information about Mr. Smith and his past business experience. On May 15, 2017, we entered into an offer letter with Mr. Smith (the “Smith Offer Letter”), pursuant to which Mr. Smith receives an annual base salary of $325,000, subject to periodic adjustment (“Smith Base Salary”), and will be eligible to participate in our Company’s short-term incentive plan with a target bonus of fifty percent (50%) of the Smith Base Salary. Pursuant to the Smith Offer Letter, Mr. Smith received a one-time grant of options covering 671,858 shares of Common Stock under our 2010 Incentive Plan in May 2017. The options have an exercise price per share equal to the per share closing price of the Common Stock on the grant date, and will vest as to one-fifth (20%) of the covered shares upon the Common Stock’s average closing share price being above each of $2.00, $3.00, $4.00, $5.00 and $6.00 per share for a ninety (90)-day period, or upon a Change in Control Event (as defined in the Smith Offer Letter ) resulting in the per share value of Common Stock being above those same thresholds (one-fifth (20%) if above $2.00, an additional one-fifth (20%) if above $3.00, an additional one-fifth (20%) if above $4.00, an additional one-fifth (20%) if above $5.00, and one hundred percent (100%) if above $6.00), subject to Mr. Smith’s continued employment on the applicable vesting date. In the event of a Change in Control Event, outstanding stock options shall immediately expire to the extent they remain unvested; provided, however, our Board, may in its sole discretion, accelerate vesting effective immediately prior to, but contingent on, a Change in Control Event. To ensure alignment with Stockholders, the options may not be exercised, and no option shares may be sold, within one hundred eighty (180) days of any portion of the options vesting, unless a Change in Control Event occurs. The options shall otherwise reflect our standard terms and conditions for employee option grants, including a 10-year term, and will vest with respect to whole shares only. In addition, the Smith Offer Letter provides that, in the event that we terminate Mr. Smith’s employment other than for “Cause” (as defined in the Smith Offer Letter, and other than in connection with or within twelve (12) months following a “Change in Control Event” (as defined in the Smith Offer Letter)), Mr. Smith will receive the accrued and unpaid amount of the Smith Base Salary through the date of termination and will continue to receive the Smith Base Salary for a period of six (6) months after the date of termination commencing with the first (1st) payroll period following the thirtieth (30th) day after the date of termination. In the event that we terminate Mr. Smith’s employment other than for Cause or if he resigns for “Good Reason” (as defined in the Smith Offer Letter) in connection with or within twelve (12) months following a Change in Control Event, he will receive the accrued and unpaid amount of the Smith Base Salary and, to the extent applicable, accrued and unpaid vacation through the date of termination, and will also continue to receive the Smith Base Salary for a period of twelve (12) months after the date of termination commencing with the first (1st) payroll period following the thirtieth (30th) day after the date of termination. Mr. Smith is also eligible for other benefits including participation in our 401(k) plan and four (4) weeks of paid time off annually. On May 15, 2017, in connection with Mr. Smith’s stock option award grant, our Board amended the terms of Section 4(c) of our 2010 Stock Incentive Plan, as amended, which limited the maximum number of shares of Common Stock for which stock options could be granted to any person in any calendar year to 350,000 shares, to permit, as a one-time waiver of such limit, the issuance of stock options covering 671,858 shares to Mr. Smith pursuant to the terms of the Smith Offer Letter. There were no arrangements or understandings between Mr. Smith and any other persons pursuant to which he was appointed as an officer of our Company (other than arrangements or understanding with Directors or officers of our Company acting solely in their capacities as such), he has no family relationships with any of our Company’s Directors, executive officers, or any person nominated or chosen by our Company to become a Director or executive officer, and he is not party to, and he does have any direct or indirect material interest in, any transaction requiring disclosure under Item 404(a) of Regulation S-K.
Rich Fitzgerald, age 51, joined our Company in June 2017. He currently serves as our Company’s COO. Mr. Fitzgerald honorably served twelve (12) years in the U.S. Marine Corps where he reached the rank of captain. Prior to joining our Company, Mr. Fitzgerald served as global vice president (“GVP”) of Avnet Integrated Solutions from January 2017 to May 2017 and as vice president of business operations of Avnet Electronics Embedded from July 2014 to January 2017. Prior to joining Avnet, he served as COO of Qual-Pro Corporation from January 2010 to July 2014 and as CEO of Team Precision Public Company Limited from July 2008 to December 2009, as well as GVP of operations for CTS Corporation, from 2002 through 2008. Before 2002, Mr. Fitzgerald held management roles in companies such as California Amplifier and Intel Corporation. In 2012, Mr. Fitzgerald filed for protection under Chapter 13 of the United States Bankruptcy Code. Mr. Fitzgerald fully paid all of his creditors and the bankruptcy was dismissed in April 2018. On May 15, 2017, we entered into an offer letter with Mr. Fitzgerald (the “Fitzgerald Offer Letter”), pursuant to which Mr. Fitzgerald will receive an annual base salary of $300,000 (the “Fitzgerald Base Salary”), subject to periodic adjustment, and will be eligible to participate in our short-term incentive plan with a target bonus of twenty-five percent (25%) of the Fitzgerald Base Salary. Pursuant to the Fitzgerald Offer Letter, Mr. Fitzgerald received a one-time grant of options covering 335,929 shares of Common Stock under our 2010 Incentive Plan in June 2017. The options have an exercise price per share equal to the per share closing price of Common Stock on the grant date, and will vest as to one-fifth (20%) of the covered shares upon the Common Stock’s average closing share price being above each of $2.00, $3.00, $4.00, $5.00 and $6.00 per share for a ninety (90)-day period, or upon a Change in Control Event (as defined in the Fitzgerald Offer Letter ) resulting in the per share value of Common Stock being above those same thresholds (one-fifth (20%) if above $2.00, an additional one-fifth (20%) if above $3.00, an additional one-fifth (20%) if above $4.00, an additional one-fifth (20%) if above $5.00, and one hundred percent (100%) if above $6.00), subject to Mr. Fitzgerald’s continued employment on the applicable vesting date. In the event of a Change in Control Event, outstanding stock options shall immediately expire to the extent they remain unvested; provided, however, our Board may, in its sole discretion, accelerate vesting effective immediately prior to, but contingent on, a Change in Control Event. To ensure alignment with Stockholders, the options may not be exercised, and no option shares may be sold, within one hundred eighty (180) days of any portion of the options vesting, unless a Change in Control Event occurs. The options shall otherwise reflect our standard terms and conditions for employee option grants, including a 10-year term, and will vest with respect to whole shares only. In addition, the Fitzgerald Offer Letter provides that, in the event that we terminate Mr. Fitzgerald’s employment other than for “Cause” (as defined in the Fitzgerald Offer Letter and other than in connection with or within twelve (12) months following a “Change in Control Event” (as defined in the Fitzgerald Offer Letter)), Mr. Fitzgerald will receive the accrued and unpaid amount of the Fitzgerald Base Salary through the date of termination and will continue to receive the Fitzgerald Base Salary for a period of six (6) months after the date of termination commencing with the first (1st) payroll period following the thirtieth (30th) day after the date of termination. In the event that we terminate Mr. Fitzgerald’s employment other than for Cause or if he resigns for “Good Reason” (as defined the Fitzgerald Offer Letter) in connection with or within twelve (12) months following a Change in Control Event, he will receive the accrued and unpaid amount of the Fitzgerald Base Salary and, to the extent applicable, accrued and unpaid vacation through the date of termination, and will also continue to receive the Fitzgerald Base Salary for a period of twelve (12) months after the date of termination commencing with the first (1st) payroll period following the thirtieth (30th) day after the date of termination. Mr. Fitzgerald is also eligible for other benefits including participation in our 401(k) plan and three (3) weeks of paid time off annually. There were no arrangements or understandings between Mr. Fitzgerald and any other persons pursuant to which he was appointed as an officer of our Company (other than arrangements or understanding with Directors or officers of our Company acting solely in their capacities as such), he has no family relationships with any of our Company’s Directors, executive officers, or any person nominated or chosen by our Company to become a Director or executive officer, and he is not party to, and he does have any direct or indirect material interest in, any transaction requiring disclosure under Item 404(a) of Regulation S-K.
Steve Waszak, age 61, joined our Company in March 2018. He currently serves as CFO and SVP of mergers and acquisitions. With more than twenty-five (25) years of experience in corporate finance and strategic development roles focusing on transformative change, Mr. Waszak has led teams through multiple merger and acquisitions transactions exceeding $1 billion in value. Prior to joining our Company, he was CFO at Connected-Holdings, LLC, a vertically integrated, Internet of Things intelligent services provider. From 2009 to 2014, Mr. Waszak served as CEO and President of BTI Systems, a developer of optical networks and innovative data-center interconnect solutions for smart-cloud providers. Mr. Waszak’s c-suite experience also includes serving as COO/CFO at Zetera Corporation and at SONOMA Systems, which was acquired by Nortel Networks. Following the acquisition of Internet Photonics (a Bell Labs spin-out), where he held the position of CFO/COO, Mr. Waszak served as vice president of global sales operation for Ciena Corporation (NYSE: CIEN). He has also served on Board of Directors of private entities and publicly-traded companies, including SMTEK International (NASDAQ: SMTK). On February 2, 2018, we entered into an offer letter with Mr. Waszak (the “Waszak Offer Letter”), pursuant to which Mr. Waszak will receive an annual base salary of $275,000 (the “Waszak Base Salary”), subject to periodic adjustment, and will be eligible to participate in our Company’s short-term incentive plan with a target bonus of thirty-three percent (33%) of his base salary. Pursuant to the Waszak Offer Letter, Mr. Waszak received a one-time grant of options covering 335,929 shares of Common Stock under our 2010 Incentive Plan in March 2018. The options have an exercise price per share equal to the per share closing price of the Common Stock on the grant date, and will vest as to one-fifth (20%) of the covered shares upon the Common Stock’s average closing share price being above each of $2.50, $3.00, $4.00, $5.00 and $6.00 per share for a ninety (90)-day period, or upon a Change in Control Event (as defined in the Waszak Offer Letter ) resulting in the per share value of the Common Stock being above those same thresholds (one-fifth (20%) if above $2.50, an additional one-fifth (20%) if above $3.00, an additional one-fifth (20%) if above $4.00, an additional one-fifth (20%) if above $5.00, and one hundred percent (100%) if above $6.00), subject to Mr. Waszak’s continued employment on the applicable vesting date. In the event of a Change in Control Event, outstanding stock options shall immediately expire to the extent they remain unvested; provided, however, our Board may, in its sole discretion, accelerate vesting effective immediately prior to, but contingent on, a Change in Control Event. To ensure alignment with Stockholders, the options may not be exercised, and no option shares may be sold, within one hundred eighty (180) days of any portion of the options vesting, unless a Change in Control Event occurs. The options shall otherwise reflect our Company’s standard terms and conditions for employee option grants, including a 10-year term, and will vest with respect to whole shares only. In addition, the Waszak Offer Letter provides that, in the event that we terminate Mr. Waszak’s employment other than for “Cause” (as defined in the Waszak Offer Letter and other than in connection with or within twelve (12) months following a “Change in Control Event” (as defined in the Waszak Offer Letter)), Mr. Waszak will receive the accrued and unpaid amount of the Waszak Base Salary through the date of termination and will continue to receive the Waszak Base Salary for a period of six (6) months after the date of termination commencing with the first (1st) payroll period following the thirtieth (30th) day after the date of termination. In the event that we terminate Mr. Waszak’s employment other than for Cause or if he resigns for “Good Reason” (as defined the Waszak Offer Letter) in connection with or within twelve (12) months following a Change in Control Event, he will receive the accrued and unpaid amount of the Waszak Base Salary and, to the extent applicable, accrued and unpaid vacation through the date of termination, and will also continue to receive the Waszak Base Salary for a period of twelve (12) months after the date of termination commencing with the first (1st) payroll period following the thirtieth (30th) day after the date of termination. Mr. Waszak is also eligible for other benefits including participation in our 401(k) plan and four (4) weeks of paid time off annually. There were no arrangements or understandings between Mr. Waszak and any other persons pursuant to which he was appointed as an officer of our Company (other than arrangements or understanding with Directors or officers of our Company acting solely in their capacities as such), he has no family relationships with any of our Company’s Directors, executive officers, or any person nominated or chosen by our Company to become a Director or executive officer, and he is not party to, and he does have any direct or indirect material interest in, any transaction requiring disclosure under Item 404(a) of Regulation S-K.
None of our officers, Directors, or any “associate” (as defined under Regulation 14A of the Exchange Act) of such persons has any substantial interest in the matters to be voted upon by our Stockholders, other than in such person’s role as an officer, Director, or Stockholder. In order for Stockholder proposals that are submitted pursuant to Rule 14a-8 of the Exchange Act, to be considered by our Company for inclusion in our Proxy Materials for our Annual Meeting, they must be received by the Secretary of our Company on or before April 8, 2019, at its principal executive offices, 7050 Woodbine Avenue, Markham, Ontario, Canada L3R 4G8. For proposals that Stockholders intend to present at our 2020 Annual Meeting outside the processes of the Rule 14a-8 of the Exchange Act, unless such Stockholder notifies our Company of such intent no later than March 10, 2020, and not earlier than February 9, 2020, any proxy that management solicits for our 2020 Annual Meeting will confer on the holder of the proxy discretionary authority to vote on the proposal so long as such proposal is properly presented at the meeting. Additionally, our by-laws set forth procedures Stockholders must comply with to make nominations for election to our Board. Such nominations must be made by notice in writing delivered or mailed to our Secretary and received at our principal executive office, 7050 Woodbine Avenue, Markham, Ontario, Canada L3R 4G8 not less than sixty (60) days (March 10, 2020) or more than ninety (90) days (February 9, 2020) prior to the anniversary date of the immediately preceding our Annual Meeting. If our 2020 Annual Meeting is not held within thirty (30) days before (April 9, 2020) or after (June 8, 2020) such anniversary date, then such nomination must have been delivered to or mailed and received by our Secretary not later than the close of business on the tenth (10th) day following the date on which the notice of the meeting was mailed or such public disclosure was made, whichever occurs first. Such notice must set forth: (a) as to each proposed nominee (i) the name, age, business address, and, if known, residence address of each such nominee, (ii) the principal occupation or employment of each such nominee, (iii) the number of shares of stock of our Company beneficially owned by each such nominee, and (iv) any other information concerning the nominee that must be disclosed as to nominees in proxy solicitations pursuant to Regulation 14A under the Exchange Act, including such person’s written consent to be named as a nominee and to serve as a Director if elected; and (b) as to the Stockholder giving the notice (i) the name and address, as they appear on our Company’s books, of such Stockholder and (ii) the class and number of shares of our Company that are beneficially owned by such Stockholder (and evidence of such ownership if not also held of record by such Stockholder). Our Company may require any proposed nominee or nominating Stockholder to furnish such other information as may reasonably be required to determine the eligibility of such proposed nominee to serve as a Director of our Company. If such procedures are not complied with, the chairman of the meeting may determine and declare to the meeting that a nomination was not made in accordance with the foregoing procedures and the defective nomination will be disregarded. We know of no other matters that will be presented for consideration at our Annual Meeting. If any other matters properly come before our Annual Meeting, it is intended that proxies in the enclosed form will be voted in respect thereof in accordance with the judgments of the persons voting the proxies. It is important that the proxies be returned promptly and that your shares are represented. Stockholders are urged to vote via toll-free telephone number, over the Internet, or, if a recipient of a paper copy of our Proxy Card, to complete, date, execute, and promptly return their proxy. Only one set of our Proxy Materials is being delivered to multiple security holders sharing an address, unless we received contrary instructions from one (1) or more of the security holders at such address. We will promptly deliver, upon written or oral request, a separate copy of our Proxy Materials to a security holder at a shared address to which a single set of our Proxy Materials was delivered. 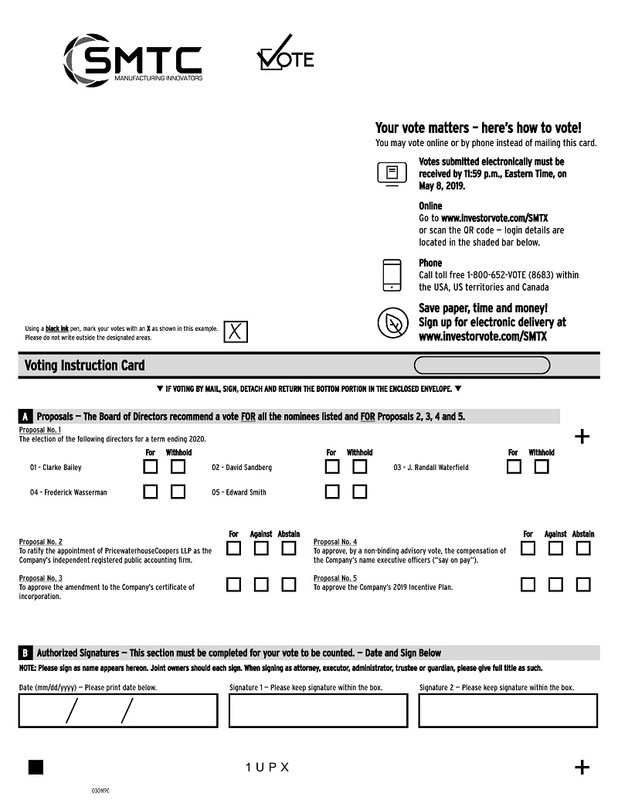 A security holder may notify us that the security holder wishes to receive a separate set of our Proxy Materials by requesting via the Internet www.investorvote.com/SMTX, via telephone at 1(800) 652-8683, or via mail at SMTC Corporation, 7050 Woodbine Avenue, Markham, Ontario, Canada L3R 4G8, Attention: Investor Relations. A security holder may use the same website, telephone number, or email to request either separate copies or a single copy for a single address for all future information statements and proxy statements, if any, and annual reports of our Company. Our audited financial statements for the year ended December 30, 2018, and other related financial and business information of our Company are contained in our Annual Report (including exhibits), are herein incorporated by reference. Copies of our Annual Report, including financial statements, may be obtained without charge by contacting SMTC Corporation, 7050 Woodbine Avenue, Markham, Ontario, Canada L3R 4G8, Attention: Investor Relations. The purpose of the SMTC Corporation 2019 Incentive Plan is to attract, retain and motivate employees, officers, directors, consultants, agents, advisors and independent contractors of the Company and its Related Companies by providing them the opportunity to acquire a proprietary interest in the Company and to align their interests and efforts to the long-term interests of the Company’s stockholders. Certain capitalized terms used in the Plan have the meanings set forth in Appendix A. (a) The Plan shall be administered by the Board and the Compensation Committee (including a subcommittee thereof), which shall be composed of two or more directors, each of whom is (i) a “non-employee director” within the meaning of Rule 16b-3(b)(3) promulgated under the Exchange Act, or any successor definition adopted by the Securities and Exchange Commission, and (ii) “independent” within the meaning of any applicable stock exchange listing rules or similar regulatory authority. (b) Notwithstanding the foregoing, the Board or the Compensation Committee may delegate concurrent responsibility for administering the Plan, including with respect to designated classes of Eligible Persons, to different committees consisting of one or more members of the Board, subject to such limitations as the Board deems appropriate, except with respect to Awards granted to Participants who are subject to Section 16 of the Exchange Act. Members of any committee shall serve for such term as the Board may determine, subject to removal by the Board at any time. To the extent consistent with applicable law, the Board or the Compensation Committee may authorize one or more officers of the Company to grant Awards to designated classes of Eligible Persons, within limits specifically prescribed by the Board or the Compensation Committee; provided, however, that no such officer shall have or obtain authority to grant Awards to himself or herself or to any person subject to Section 16 of the Exchange Act. (c) All references in the Plan to the “Administrator” shall be, as applicable, to (i) the Compensation Committee or (ii) any other committee or any officer to whom authority has been delegated to administer the Plan, within the limits of such delegated authority. (a) Except for the terms and conditions explicitly set forth in the Plan and to the extent permitted by applicable law, the Administrator shall have full power and exclusive authority, subject to such orders or resolutions not inconsistent with the provisions of the Plan as may from time to time be adopted by the Board or the Compensation Committee, to (i) select the Eligible Persons to whom Awards may from time to time be granted under the Plan; (ii) determine the type or types of Awards to be granted to each Participant under the Plan; (iii) determine the number of shares of Common Stock to be covered by each Award granted under the Plan; (iv) determine the terms and conditions of any Award granted under the Plan; (v) approve the forms of notice or agreement for use under the Plan; (vi) determine whether, to what extent and under what circumstances Awards may be settled in cash, shares of Common Stock or other property or canceled or suspended; (vii) interpret and administer the Plan and any instrument evidencing an Award, notice or agreement executed or entered into under the Plan; (viii) establish such rules and regulations as it shall deem appropriate for the proper administration of the Plan; (ix) delegate ministerial duties to such of the Company’s employees as it so determines; and (x) make any other determination and take any other action that the Administrator deems necessary or desirable for administration of the Plan. (b) In no event, however, shall the Administrator have the right, without stockholder approval, to (i) reduce the exercise or grant price of an Option or SAR after it is granted; (ii) cancel an Option or SAR at a time when its exercise or grant price exceeds the Fair Market Value of the underlying stock, in exchange for cash, another option or stock appreciation right, restricted stock, or other equity award; or (iii) take any other action that is treated as a repricing under generally accepted accounting principles. (c) The effect on the vesting of an Award of a Company-approved leave of absence or a Participant’s reduction in hours of employment or service shall be determined by the Company’s chief human resources officer or other person performing that function or, with respect to directors or executive officers, by the Compensation Committee, whose determination shall be final. (d) Decisions of the Administrator shall be final, conclusive and binding on all persons, including the Company, any Participant, any stockholder and any Eligible Person. A majority of the members of the Administrator may determine its actions. (b) any shares subject to outstanding awards under the Company’s 2010 Incentive Plan (the “Prior Plan”) on the Effective Date that on or after such date cease to be subject to such awards (other than by reason of exercise or settlement of the awards to the extent they are exercised for or settled in vested or nonforfeitable shares), up to an aggregate maximum of 1,913,024 shares, which shares shall cease to be set aside or reserved for issuance pursuant to the Prior Plan as of the date they cease to be so subject to such awards, and shall instead be set aside and reserved for issuance pursuant to the Plan. Shares issued under the Plan shall be drawn from authorized and unissued shares or shares now held or subsequently acquired by the Company as treasury shares. (a) Shares of Common Stock covered by an Award shall not be counted as used unless and until they are actually issued and delivered to a Participant. If any Award lapses, expires, terminates or is canceled prior to the issuance of shares thereunder or if shares of Common Stock are issued under the Plan to a Participant and thereafter are forfeited to or otherwise reacquired by the Company, the shares subject to such Awards and the forfeited or reacquired shares shall again be available for issuance under the Plan. Any shares of Common Stock (i) tendered by a Participant or retained by the Company as full or partial payment to the Company for the purchase price of an Award or to satisfy tax withholding obligations in connection with an Award or (ii) covered by an Award that is settled in cash, or in a manner such that some or all of the shares of Common Stock covered by the Award are not issued, shall not be available for new Awards under the Plan. The number of shares of Common Stock available for issuance under the Plan shall not be reduced to reflect any dividends or dividend equivalents that are reinvested into additional shares of Common Stock or credited as additional shares of Common Stock subject or paid with respect to an Award. (b) The Administrator shall also, without limitation, have the authority to grant Awards as an alternative to or as the form of payment for grants or rights earned or due under other compensation plans or arrangements of the Company. (c) Notwithstanding any other provision of the Plan to the contrary, the Administrator may grant Substitute Awards under the Plan. Substitute Awards shall not reduce the number of shares authorized for issuance under the Plan. In the event that an Acquired Entity has shares available for awards or grants under one or more preexisting plans not adopted in contemplation of such acquisition or combination and previously approved by the Acquired Entity’s stockholders, then, to the extent determined by the Board or the Compensation Committee, the shares available for grant pursuant to the terms of such preexisting plans (as adjusted, to the extent appropriate, using the exchange ratio or other adjustment or valuation ratio or formula used in such acquisition or combination to determine the consideration payable to holders of securities of the entities that are parties to such acquisition or combination) may be used for Awards under the Plan and shall not reduce the number of shares of Common Stock authorized for issuance under the Plan; provided, however, that Awards using such available shares shall not be made after the date awards or grants could have been made under the terms of such preexisting plans, absent the acquisition or combination, and shall only be made to individuals who were not employees or directors of the Company or a Related Company prior to such acquisition or combination. In the event that a written agreement between the Company and an Acquired Entity pursuant to which a merger or consolidation is completed is approved by the Board and that agreement sets forth the terms and conditions of the substitution for or assumption of outstanding awards of the Acquired Entity, those terms and conditions shall be deemed to be the action of the Administrator without any further action by the Administrator, except as may be required for compliance with Rule 16b-3 under the Exchange Act, and the persons holding such awards shall be deemed to be Participants. (d) Notwithstanding any other provision of this Section 4.2 to the contrary, the maximum number of shares that may be issued upon the exercise of Incentive Stock Options shall equal the aggregate share number stated in Section 4.1(a), subject to adjustment as provided in Section 15.1. Subject to adjustment from time to time as provided in Section 15.1, no Participant may be granted Awards other than Performance Units in a single calendar year with respect to more than 1,000,000 shares of Common Stock under such Awards. The maximum dollar value payable with respect to Performance Units or other awards payable in cash to any Participant in any calendar year is $1,000,000. Notwithstanding any other provision of the Plan to the contrary, no member of the Board who is also not an employee of the Company or a Related Company may be granted Awards or cash compensation in a single calendar year solely with respect to service as a member of the Board that exceeds in the aggregate $500,000 in value (such value for Awards denominated in shares computed as of the Grant Date of such Awards based on the Grant Date fair value of such Awards in accordance with applicable financial accounting rules). For purposes of the foregoing limit, Awards granted in previous calendar years will not count against the Award limits in subsequent calendar years, even if the Awards from previous calendar years are earned, vest or are otherwise settled in calendar years following the calendar year in which they are granted. An Award may be granted to any employee, officer or director of the Company or a Related Company whom the Administrator from time to time selects. An Award may also be granted to any consultant, agent, advisor or independent contractor for bona fide services rendered to the Company or any Related Company that (a) are not in connection with the offer and sale of the Company’s securities in a capital-raising transaction and (b) do not directly or indirectly promote or maintain a market for the Company’s securities. The Administrator shall have the authority, in its sole discretion, to determine the type or types of Awards to be granted under the Plan. Such Awards may be granted either alone or in addition to or in tandem with any other type of Award. Any Award settlement may be subject to such conditions, restrictions and contingencies as the Administrator shall determine. Awards granted under the Plan shall be evidenced by a written, including an electronic, instrument that shall contain such terms, conditions, limitations and restrictions as the Administrator shall deem advisable and that are not inconsistent with the Plan. To the extent permitted by applicable law, the Administrator may permit or require a Participant to defer receipt of the payment of any Award. If any such deferral election is permitted or required, the Administrator, in its sole discretion, shall establish rules and procedures for such payment deferrals, which may include the grant of additional Awards or provisions for the payment or crediting of interest or dividend equivalents, including converting such credits to deferred stock unit equivalents. All deferrals by Participants shall be made in accordance with Section 409A. Participants may, if the Administrator so determines, other than with respect to Options or Stock Appreciation Rights, be credited with dividends or dividend equivalents for dividends paid with respect to shares of Common Stock underlying an Award in a manner determined by the Administrator in its sole discretion; provided, however, that with respect to Awards that are subject to achievement of performance goals or vesting, any such credited dividends or dividend equivalents may be paid only with respect to the portion of such Awards that is actually earned or vested, as applicable. The Administrator may apply any restrictions to the dividends or dividend equivalents that the Administrator deems appropriate. The Administrator, in its sole discretion, may determine the form of payment of dividends or dividend equivalents, including cash, shares of Common Stock, Restricted Stock or Stock Units. Also notwithstanding the foregoing, the right to any dividends or dividend equivalents declared and paid on Restricted Stock must comply with or qualify for an exemption under Section 409A. The Administrator may grant Options designated as Incentive Stock Options or Nonqualified Stock Options. Options shall be granted with an exercise price per share not less than 100% of the Fair Market Value of the Common Stock on the Grant Date (and shall not be less than the minimum exercise price required by Section 422 of the Code with respect to Incentive Stock Options), except in the case of Substitute Awards. Subject to earlier termination in accordance with the terms of the Plan and the instrument evidencing the Option, the maximum term of an Option shall be ten years from the Grant Date. For Incentive Stock Options, the maximum term shall comply with Section 422 of the Code. (b) To the extent an Option has vested and become exercisable, the Option may be exercised in whole or from time to time in part by delivery to or as directed or approved by the Company of a properly executed stock option exercise agreement or notice, in a form and in accordance with procedures established by the Administrator, setting forth the number of shares with respect to which the Option is being exercised, the restrictions imposed on the shares purchased under such exercise agreement or notice, if any, and such representations and agreements as may be required by the Administrator, accompanied by payment in full as described in Section 7.5. An Option may be exercised only for whole shares and may not be exercised for less than a reasonable number of shares at any one time, as may be determined by the Administrator. (f) such other consideration as the Administrator may permit. (a) The Administrator shall establish and set forth in each instrument that evidences an Option whether the Option shall continue to be exercisable, and the terms and conditions of such exercise, after a Termination of Service, any of which provisions may be waived or modified by the Administrator at any time. (b) Notwithstanding the foregoing, unless otherwise provided in the instrument that evidences an Option, in the event a Participant’s Termination of Service occurs for Cause, all Options granted to the Participant shall automatically expire upon first notification to the Participant of such termination, unless the Administrator determines otherwise. If a Participant’s employment or service relationship with the Company is suspended pending an investigation of whether the Participant shall be terminated for Cause, all the Participant’s rights under any Option shall likewise be suspended during the period of investigation. If any facts that would constitute termination for Cause are discovered after a Participant’s Termination of Service, any Option then held by the Participant may be immediately terminated by the Administrator, in its sole discretion. (c) Further notwithstanding the foregoing, if exercise of the Option following a Participant’s Termination of Service, but while the Option is otherwise exercisable, would be prohibited solely because the issuance of Common Stock upon exercise of the Option would violate the registration requirements under the Securities Act, then the Option shall remain exercisable until the earlier of (i) the Option Expiration Date and (ii) the expiration of a total period of three months (or such longer period of time as determined by the Administrator in its sole discretion), which time period need not be consecutive, after the Participant’s Termination of Service during which exercise of the Option would not be in violation of the Securities Act. Individuals who are not employees of the Company or one of its parent or subsidiary corporations (as such terms are defined for purposes of Section 422 of the Code) on the Grant Date may not be granted Incentive Stock Options. To the extent the aggregate Fair Market Value of Common Stock with respect to which Incentive Stock Options are exercisable for the first time by a Participant during any calendar year exceeds $100,000 (or, if different, the maximum limitation in effect at the time of grant under the Code), such portion in excess of $100,000 shall be treated as a Nonqualified Stock Option. In the case of an Incentive Stock Option granted to a Participant who owns more than 10% of the total combined voting power of all classes of the stock of the Company or of its parent or subsidiary corporations (a “Ten Percent Stockholder”), such Option shall be granted with an exercise price per share not less than 110% of the Fair Market Value of the Common Stock on the Grant Date and with a maximum term of five years from the Grant Date. The determination of more than 10% ownership shall be made in accordance with Section 422 of the Code. The Administrator may grant Stock Appreciation Rights to Participants at any time on such terms and conditions as the Administrator shall determine in its sole discretion. An SAR may be granted in tandem with an Option (a “tandem SAR”) or alone (a “freestanding SAR”). The grant price of a tandem SAR shall be equal to the exercise price of the related Option. The grant price of a freestanding SAR shall be established in accordance with procedures for Options set forth in Section 7.2. An SAR may be exercised upon such terms and conditions and for such term as the Administrator determines in its sole discretion; provided, however, that, subject to earlier termination in accordance with the terms of the Plan and the instrument evidencing the SAR, the maximum term of a freestanding SAR shall be ten years, and in the case of a tandem SAR, (a) the term shall not exceed the term of the related Option and (b) the tandem SAR may be exercised for all or part of the shares subject to the related Option upon the surrender of the right to exercise the equivalent portion of the related Option, except that the tandem SAR may be exercised only with respect to the shares for which its related Option is then exercisable. Upon the exercise of an SAR, a Participant shall be entitled to receive payment in an amount determined by multiplying: (a) the difference between the Fair Market Value of the Common Stock on the date of exercise over the grant price of the SAR by (b) the number of shares with respect to which the SAR is exercised. At the discretion of the Administrator as set forth in the instrument evidencing the Award, the payment upon exercise of an SAR may be in cash, in shares, in some combination thereof or in any other manner approved by the Administrator in its sole discretion. The Administrator may grant Stock Awards, Restricted Stock and Stock Units on such terms and conditions and subject to such repurchase or forfeiture restrictions, if any, which may be based on continuous service with the Company or a Related Company or the achievement of any performance goals, as the Administrator shall determine in its sole discretion, which terms, conditions and restrictions shall be set forth in the instrument evidencing the Award. Upon the satisfaction of any terms, conditions and restrictions prescribed with respect to Restricted Stock or Stock Units, or upon a Participant’s release from any terms, conditions and restrictions on Restricted Stock or Stock Units, as determined by the Administrator, (a) the shares covered by each Award of Restricted Stock shall become freely transferable by the Participant, and (b) Stock Units shall be paid in shares of Common Stock or, if set forth in the instrument evidencing the Awards, in cash or a combination of cash and shares of Common Stock. Any fractional shares subject to such Awards shall be paid to the Participant in cash. The Administrator may grant Awards of Performance Shares, designate the Participants to whom Performance Shares are to be awarded and determine the number of Performance Shares and the terms and conditions of each such Award. Performance Shares shall consist of a unit valued by reference to a designated number of shares of Common Stock, the value of which may be paid to the Participant by delivery of shares of Common Stock or, if set forth in the instrument evidencing the Award, of such property as the Administrator shall determine, including, without limitation, cash, shares of Common Stock, other property, or any combination thereof, upon the attainment of performance goals, as established by the Administrator, and other terms and conditions specified by the Administrator. The amount to be paid under an Award of Performance Shares may be adjusted on the basis of such further consideration as the Administrator shall determine in its sole discretion. The Administrator may grant Awards of Performance Units, designate the Participants to whom Performance Units are to be awarded and determine the number of Performance Units and the terms and conditions of each such Award. Performance Units shall consist of a unit valued by reference to a designated amount of property other than shares of Common Stock, which value may be paid to the Participant by delivery of such property as the Administrator shall determine, including, without limitation, cash, shares of Common Stock, other property, or any combination thereof, upon the attainment of performance goals, as established by the Administrator, and other terms and conditions specified by the Administrator. The amount to be paid under an Award of Performance Units may be adjusted on the basis of such further consideration as the Administrator shall determine in its sole discretion. Subject to the terms of the Plan and such other terms and conditions as the Administrator deems appropriate, the Administrator may grant other incentives payable in cash or in shares of Common Stock under the Plan. (a) The Company may require the Participant to pay to the Company or a Related Company, as applicable, the amount of (i) any taxes that the Company or a Related Company is required by applicable federal, state, local or foreign law to withhold with respect to the grant, vesting or exercise of an Award (“tax withholding obligations”) and (ii) any amounts due from the Participant to the Company or any Related Company (“other obligations”). Notwithstanding any other provision of the Plan to the contrary, the Company shall not be required to issue any shares of Common Stock or otherwise settle an Award under the Plan until such tax withholding obligations and other obligations are satisfied. (b) The Administrator, its sole discretion, may permit or require a Participant to satisfy all or part of the Participant’s tax withholding obligations and other obligations by (i) paying cash to the Company or a Related Company, as applicable, (ii) having the Company withhold an amount from any cash amounts otherwise due or to become due from the Company or a Related Company to the Participant, (iii) having the Company withhold a number of shares of Common Stock that would otherwise be issued to the Participant (or become vested, in the case of Restricted Stock) having a Fair Market Value equal to the tax withholding obligations and other obligations, (iv) surrendering a number of shares of Common Stock the Participant already owns having a value equal to the tax withholding obligations and other obligations, (v) selling shares of Common Stock issued under an Award on the open market or to the Company, or (vi) taking such other action as may be necessary in the opinion of the Administrator to satisfy any applicable tax withholding obligations. The value of the shares so withheld or tendered may not exceed the employer’s applicable minimum required tax withholding rate or such other applicable rate as is necessary to avoid adverse treatment for financial accounting purposes, as determined by the Administrator in its sole discretion. No Award or interest in an Award may be sold, assigned, pledged (as collateral for a loan or as security for the performance of an obligation or for any other purpose) or transferred by a Participant or made subject to attachment or similar proceedings otherwise than by will or by the applicable laws of descent and distribution, except to the extent the Participant designates one or more beneficiaries on a Company-approved form who may exercise the Award or receive payment under the Award after the Participant’s death. During a Participant’s lifetime, an Award may be exercised only by the Participant. Notwithstanding the foregoing, and to the extent permitted by Section 422 of the Code, the Administrator, in its sole discretion, may permit a Participant to assign or transfer an Award pursuant to a gift or for family estate planning purposes, subject to such terms and conditions as the Administrator shall specify. (a) In the event, at any time or from time to time, a stock dividend, stock split, spin-off, combination or exchange of shares, recapitalization, merger, consolidation, distribution to stockholders other than a normal cash dividend, or other change in the Company’s corporate or capital structure results in (i) the outstanding shares of Common Stock, or any securities exchanged therefor or received in their place, being exchanged for a different number or kind of securities of the Company or (ii) new, different or additional securities of the Company or any other company being received by the holders of shares of Common Stock, then the Administrator shall make proportional adjustments in (1) the maximum number and kind of securities available for issuance under the Plan (including all share amounts set forth in Section 4); (2) the maximum number and kind of securities issuable as Incentive Stock Options as set forth in Section 4.2(d); and (3) the number and kind of securities that are subject to any outstanding Award and the per share price of such securities, without any change in the aggregate price to be paid therefor. In addition, the Administrator, in its sole discretion, also may make any of the foregoing adjustments in the event of any distribution of assets or cash to stockholders other than a normal cash dividend or similar event in a manner intended to preserve the value of outstanding Awards, subject to Section 15.7 and the requirements of Section 422 of the Code for Incentive Stock Options. The determination by the Administrator as to the terms of any of the foregoing adjustments shall be conclusive and binding. (b) Notwithstanding the foregoing, the issuance by the Company of shares of stock of any class, or securities convertible into shares of stock of any class, for cash or property, or for labor or services rendered, either upon direct sale or upon the exercise of rights or warrants to subscribe therefor, or upon conversion of shares or obligations of the Company convertible into such shares or other securities, shall not affect, and no adjustment by reason thereof shall be made with respect to, outstanding Awards. Also notwithstanding the foregoing, a dissolution or liquidation of the Company or a Change of Control shall not be governed by this Section 15.1 but shall be governed by Sections 15.2 and 15.3, respectively. To the extent not previously exercised or settled, and unless otherwise determined by the Administrator in its sole discretion, Awards shall terminate immediately prior to the dissolution or liquidation of the Company. To the extent a vesting condition, forfeiture provision or repurchase right applicable to an Award has not been waived by the Administrator, the Award shall be forfeited immediately prior to the consummation of the dissolution or liquidation. (a) If and to the extent that a Successor Company converts, assumes, substitutes for or replaces an Award, the vesting restrictions and/or forfeiture provisions applicable to such Award shall not be accelerated or lapse, and all such vesting restrictions and/or forfeiture provisions shall continue with respect to any shares of the Successor Company or other consideration that may be received with respect to such Award. If and to the extent that such Awards are not converted, assumed, substituted for or replaced by the Successor Company in a Covered Transaction or the transaction is one in which such Awards could not be converted, assumed, substituted for or replaced, such outstanding Awards shall terminate at the effective time of the Covered Transaction and, solely in the Administrator’s discretion, such Awards may become vested and exercisable or payable in whole or in part, and all applicable restrictions or forfeiture provisions may lapse in whole or in part, immediately prior to the Covered Transaction. For the purposes of Section 15.3(a), an Award shall be considered converted, assumed, substituted for or replaced by the Successor Company if following the Covered Transaction the Award confers the right to purchase or receive, for each share of Common Stock subject to the Award immediately prior to the Covered Transaction, the consideration (whether stock, cash or other securities or property) to be received in the Covered Transaction by holders of Common Stock for each share held on the effective date of the transaction (and if holders were offered a choice of consideration, the type of consideration chosen by the holders of a majority of the outstanding shares); provided, however, that if such consideration received in the Covered Transaction is not solely common stock of the Successor Company, the Administrator may, with the consent of the Successor Company, provide for the consideration to be received pursuant to the Award, for each share of Common Stock subject thereto, to be solely common stock of the Successor Company substantially equal in fair market value to the per share consideration received by holders of Common Stock in the Covered Transaction. The determination of such substantial equality of value of consideration shall be made by the Administrator, and its determination shall be conclusive and binding. (b) All Performance Shares, Performance Units and other outstanding Awards that are subject to vesting based on the achievement of specified performance goals and that are earned and outstanding as of the date the Covered Transaction is determined to have occurred and for which the payout level has been determined shall be payable in full in accordance with the payout schedule pursuant to the instrument evidencing the Award. All Performance Shares, Performance Units and other outstanding Awards that are subject to vesting based on the achievement of specified performance goals for which the payout level has not been determined as of the date of the Covered Transaction shall be prorated at the target payout level up to and including the date of such Covered Transaction and shall be payable in accordance with the payout schedule set forth in the instrument evidencing the Award. Any existing deferrals or other restrictions not waived by the Administrator in its sole discretion shall remain in effect. (c) Notwithstanding the foregoing, the Administrator, in its sole discretion, may instead provide in the event of a Covered Transaction that a Participant’s outstanding Awards shall terminate upon or immediately prior to such Covered Transaction and that such Participant shall receive, in exchange therefor, a cash payment equal to the amount (if any) by which (x) the value of the per share consideration received by holders of Common Stock in the Covered Transaction, or, in the event the Covered Transaction does not result in direct receipt of consideration by holders of Common Stock, the value of the deemed per share consideration received, in each case as determined by the Administrator in its sole discretion, multiplied by the number of shares of Common Stock subject to such outstanding Awards (to the extent then vested and exercisable or whether or not then vested and exercisable, as determined by the Administrator in its sole discretion) exceeds (y) if applicable, the respective aggregate exercise price or grant price for such Awards. (d) For the avoidance of doubt, nothing in this Section 15.3 requires all outstanding Awards (or portions thereof) to be treated similarly. Subject to Sections 15.2 and 15.3, the Administrator shall have the discretion, exercisable at any time before a sale, merger, consolidation, reorganization, liquidation, dissolution or change of control of the Company, as defined by the Administrator, to take such further action as it determines to be necessary or advisable with respect to Awards. Such authorized action may include (but shall not be limited to) establishing, amending or waiving the type, terms, conditions or duration of, or restrictions on, Awards so as to provide for earlier, later, extended or additional time for exercise, lifting restrictions and other modifications, and the Administrator may take such actions with respect to all Participants, to certain categories of Participants or only to individual Participants. The Administrator may take such action before or after granting Awards to which the action relates and before or after any public announcement with respect to such sale, merger, consolidation, reorganization, liquidation, dissolution or change of control that is the reason for such action. The grant of Awards shall in no way affect the Company’s right to adjust, reclassify, reorganize or otherwise change its capital or business structure or to merge, consolidate, dissolve, liquidate or sell or transfer all or any part of its business or assets. In the event of any adjustment in the number of shares covered by any Award, each such Award shall cover only the number of full shares resulting from such adjustment, and any fractional shares resulting from such adjustment shall be disregarded. Notwithstanding any other provision of the Plan to the contrary, (a) any adjustments made pursuant to this Section 15 to Awards that are considered “deferred compensation” within the meaning of Section 409A shall be made in compliance with the requirements of Section 409A and (b) any adjustments made pursuant to this Section 15 to Awards that are not considered “deferred compensation” subject to Section 409A shall be made in such a manner as to ensure that after such adjustment the Awards either (i) continue not to be subject to Section 409A or (ii) comply with the requirements of Section 409A. The Board or the Compensation Committee may amend, suspend or terminate the Plan or any portion of the Plan at any time and in such respects as it shall deem advisable; provided, however, that, to the extent required by applicable law, regulation or stock exchange rule, stockholder approval shall be required for any amendment to the Plan; and provided, further, that any amendment that requires stockholder approval may be made only by the Board. Subject to Section 16.3, the Administrator may amend the terms of any outstanding Award, prospectively or retroactively. Unless sooner terminated as provided herein, the Plan shall automatically terminate on the tenth anniversary of the earlier of (a) the date the Board adopted the Plan and (b) the date the stockholders approved the Plan. After the Plan is terminated, no future Awards may be granted, but Awards previously granted shall remain outstanding in accordance with their terms and conditions and the Plan’s terms and conditions. The amendment, suspension or termination of the Plan or a portion thereof or the amendment of an outstanding Award shall not, without the Participant’s consent, materially adversely affect any rights under any Award theretofore granted to the Participant under the Plan. Any change or adjustment to an outstanding Incentive Stock Option shall not, without the consent of the Participant, be made in a manner so as to constitute a “modification” that would cause such Incentive Stock Option to fail to continue to qualify as an Incentive Stock Option. Notwithstanding the foregoing, any adjustments made pursuant to Section 15 shall not be subject to these restrictions. No individual or Participant shall have any claim to be granted any Award under the Plan, and the Company has no obligation for uniformity of treatment of Participants under the Plan. Furthermore, nothing in the Plan or any Award granted under the Plan shall be deemed to constitute an employment contract or confer or be deemed to confer on any Participant any right to continue in the employ of, or to continue any other relationship with, the Company or any Related Company or limit in any way the right of the Company or any Related Company to terminate a Participant’s employment or other relationship at any time, with or without cause. (a) Notwithstanding any other provision of the Plan, the Company shall have no obligation to issue or deliver any shares of Common Stock under the Plan or make any other distribution of benefits under the Plan unless, in the opinion of the Company’s counsel, such issuance, delivery or distribution would comply with all applicable laws (including, without limitation, the requirements of the Securities Act or the laws of any state or foreign jurisdiction) and the applicable requirements of any securities exchange or similar entity. (b) The Company shall be under no obligation to any Participant to register for offering or resale or to qualify for exemption under the Securities Act, or to register or qualify under the laws of any state or foreign jurisdiction, any shares of Common Stock, security or interest in a security paid or issued under, or created by, the Plan, or to continue in effect any such registrations or qualifications if made. (c) As a condition to the exercise of an Option or any other receipt of Common Stock pursuant to an Award under the Plan, the Company may require (i) the Participant to represent and warrant at the time of any such exercise or receipt that such shares are being purchased or received only for the Participant’s own account and without any present intention to sell or distribute such shares and (ii) such other action or agreement by the Participant as may from time to time be necessary to comply with federal, state and foreign securities laws. At the option of the Company, a stop-transfer order against any such shares may be placed on the official stock books and records of the Company, and a legend indicating that such shares may not be pledged, sold or otherwise transferred, unless an opinion of counsel is provided (concurred in by counsel for the Company) stating that such transfer is not in violation of any applicable law or regulation, may be stamped on stock certificates to ensure exemption from registration. The Administrator may also require the Participant to execute and deliver to the Company a purchase agreement or such other agreement as may be in use by the Company at such time that describes certain terms and conditions applicable to the shares. (d) To the extent the Plan or any instrument evidencing an Award provides for issuance of stock certificates to reflect the issuance of shares of Common Stock, the issuance may be effected on a noncertificated basis, to the extent not prohibited by applicable law or the applicable rules of any stock exchange. (a) Each person who is or shall have been a member of the Board, the Compensation Committee, or a committee of the Board or an officer of the Company to whom authority to administer the Plan was delegated in accordance with Section 3.1, shall be indemnified and held harmless by the Company against and from any loss, cost, liability or expense that may be imposed upon or reasonably incurred by such person in connection with or resulting from any claim, action, suit or proceeding to which such person may be a party or in which such person may be involved by reason of any action taken or failure to act under the Plan and against and from any and all amounts paid by such person in settlement thereof, with the Company’s approval, or paid by such person in satisfaction of any judgment in any such claim, action, suit or proceeding against such person, unless such loss, cost, liability or expense is a result of such person’s own willful misconduct or except as expressly provided by statute; provided, however, that such person shall give the Company an opportunity, at its own expense, to handle and defend the same before such person undertakes to handle and defend it on such person’s own behalf. (b) The foregoing right of indemnification shall not be exclusive of any other rights of indemnification to which such person may be entitled under the Company’s certificate of incorporation or bylaws, as a matter of law, or otherwise, or of any power that the Company may have to indemnify or hold harmless. Unless otherwise provided by the Administrator or in the instrument evidencing the Award or in a written employment, services or other agreement, no Award, other than a Stock Award, shall entitle the Participant to any cash dividend, voting or other right of a stockholder unless and until the date of issuance under the Plan of the shares that are the subject of such Award. (a) In interpreting and applying the provisions of the Plan, any Option granted as an Incentive Stock Option pursuant to the Plan shall, to the extent permitted by law, be construed as an “incentive stock option” within the meaning of Section 422 of the Code. (b) The Plan and Awards granted under the Plan are intended to be exempt from the requirements of Section 409A to the maximum extent possible, whether pursuant to the short-term deferral exception described in Treasury Regulation Section 1.409A-1(b)(4), the exclusion applicable to stock options, stock appreciation rights and certain other equity-based compensation under Treasury Regulation Section 1.409A-1(b)(5), or otherwise. To the extent Section 409A is applicable to the Plan or any Award granted under the Plan, it is intended that the Plan and any Awards granted under the Plan shall comply with the deferral, payout and other limitations and restrictions imposed under Section 409A. Notwithstanding any other provision of the Plan or any Award granted under the Plan to the contrary, the Plan and any Award granted under the Plan shall be interpreted, operated and administered in a manner consistent with such intentions. Without limiting the generality of the foregoing, and notwithstanding any other provision of the Plan or any Award granted under the Plan to the contrary, with respect to any payments and benefits under the Plan or any Award granted under the Plan to which Section 409A applies, all references in the Plan or any Award granted under the Plan to the termination of the Participant’s employment or service are intended to mean the Participant’s “separation from service,” within the meaning of Section 409A(a)(2)(A)(i). In addition, if the Participant is a “specified employee,” within the meaning of Section 409A, then to the extent necessary to avoid subjecting the Participant to the imposition of any additional tax under Section 409A, amounts that would otherwise be payable under the Plan or any Award granted under the Plan during the six-month period immediately following the Participant’s “separation from service,” within the meaning of Section 409A(a)(2)(A)(i), shall not be paid to the Participant during such period, but shall instead be accumulated and paid to the Participant (or, in the event of the Participant’s death, the Participant’s estate) in a lump sum on the first business day after the earlier of the date that is six months following the Participant’s separation from service or the Participant’s death. Notwithstanding any other provision of the Plan to the contrary, the Administrator, to the extent it deems necessary or advisable in its sole discretion, reserves the right, but shall not be required, to unilaterally amend or modify the Plan and any Award granted under the Plan so that the Award qualifies for exemption from or complies with Section 409A; provided, however, that the Administrator makes no representations that Awards granted under the Plan shall be exempt from or comply with Section 409A and makes no undertaking to preclude Section 409A from applying to Awards granted under the Plan. (c) Also notwithstanding any other provision of the Plan to the contrary, the Board or the Compensation Committee shall have broad authority to amend the Plan or any outstanding Award without the consent of the Participant to the extent the Board or the Compensation Committee deems necessary or advisable to comply with, or take into account, changes in applicable tax laws, securities laws, accounting rules or other applicable laws, rules or regulations. Without amending the Plan, the Administrator may grant Awards to Eligible Persons who are foreign nationals on such terms and conditions different from those specified in the Plan as may, in the judgment of the Administrator, be necessary or desirable to foster and promote achievement of the purposes of the Plan and shall have the authority to adopt such modifications, procedures, subplans and the like as may be necessary or desirable to comply with provisions of the laws or regulations of other countries or jurisdictions in which the Company or any Related Company may operate or have employees to ensure the viability of the benefits from Awards granted to Participants employed in such countries or jurisdictions, meet the requirements that permit the Plan to operate in a qualified or tax-efficient manner, comply with applicable foreign laws or regulations and meet the objectives of the Plan. The Plan is intended to constitute an “unfunded” plan. Nothing contained herein shall require the Company to segregate any monies or other property, or shares of Common Stock, or to create any trusts, or to make any special deposits for any immediate or deferred amounts payable to any Participant, and no Participant shall have any rights that are greater than those of a general unsecured creditor of the Company. All obligations of the Company under the Plan with respect to Awards shall be binding on any successor to the Company, whether the existence of such successor is the result of a direct or indirect purchase, merger, consolidation, or otherwise, of all or substantially all the business and/or assets of the Company. If any provision of the Plan or any Award is determined to be invalid, illegal or unenforceable in any jurisdiction, or as to any person, or would disqualify the Plan or any Award under any law deemed applicable by the Administrator, such provision shall be construed or deemed amended to conform to applicable laws, or, if it cannot be so construed or deemed amended without, in the Administrator’s determination, materially altering the intent of the Plan or the Award, such provision shall be stricken as to such jurisdiction, person or Award, and the remainder of the Plan and any such Award shall remain in full force and effect. The Plan, all Awards granted thereunder and all determinations made and actions taken pursuant hereto, to the extent not otherwise governed by the laws of the United States, shall be governed by the laws of the State of Delaware without giving effect to principles of conflicts of law. The granting of Awards and the issuance of shares of Common Stock under the Plan are subject to all applicable laws, rules and regulations and to such approvals by any governmental agencies or national securities exchanges as may be required. Awards shall be subject to the requirements of (a) Section 954 of the Dodd-Frank Wall Street Reform and Consumer Protection Act (regarding recovery of erroneously awarded compensation) and any implementing rules and regulations thereunder, (b) similar rules under the laws of any other jurisdiction, (c) any compensation recovery or clawback policies adopted by the Company to implement any such requirements or (d) any other compensation recovery or clawback policies as may be adopted from time to time by the Company, all to the extent determined by the Administrator in its discretion to be applicable to a Participant. The Plan, as amended and restated, shall become effective on the date of stockholder approval (the “Effective Date”). “Acquired Entity” means any entity acquired by the Company or a Related Company or with which the Company or a Related Company merges or combines. “Administrator” has the meaning set forth in Section 3.1. “Award” means any Option, Stock Appreciation Right, Stock Award, Restricted Stock, Stock Unit, Performance Share, Performance Unit, cash-based award or other incentive payable in cash or in shares of Common Stock as may be designated by the Administrator from time to time. “Board” means the Board of Directors of the Company. “Cause,” unless otherwise defined in the instrument evidencing an Award or in a written employment, services or other agreement between the Participant and the Company or a Related Company, means the Participant’s (a) engaging in willful or gross misconduct or willful or gross neglect; (b) repeatedly failing to adhere to the directions of superiors or the Board or the written policies and practices of the Company or its Related Companies; (c) commission of a felony or a crime of moral turpitude, dishonesty, breach of trust or unethical business conduct, or any crime involving the Company or any Related Company thereof; (d) fraud, misappropriation, or embezzlement; (e) unauthorized use or disclosure of confidential information or trade secrets or other material violation of any agreement with the Company or a Related Company; (f) action or omission constituting a material failure to substantially and adequately perform the duties assigned to the Participant; (g) illegal act detrimental to the Company or its Related Companies; or (h) repeated failure to devote substantially all of Participant’s business time and efforts to the Company or a Related Company in breach of any express commitment by the Participant, in each case determined by the Company’s chief human resources officer or other person performing that function or, in the case of directors and executive officers, the Compensation Committee, whose determination shall be conclusive and binding. “Code” means the Internal Revenue Code of 1986, as amended from time to time. “Common Stock” means the common stock, par value $0.01 per share, of the Company. “Company” means SMTC Corporation, a Delaware corporation. “Covered Transaction” means any of (i) a consolidation, merger, or similar transaction or series of related transactions, including a sale or other disposition of stock, in which the Company is not the surviving corporation or which results in the acquisition of all or substantially all of the Company’s then outstanding common stock by a single person or entity or by a group of persons and/or entities acting in concert, (ii) a sale or transfer of all or substantially all the Company’s assets, or (iii) a change in the composition of the Board such that the members of the Board at the beginning of any consecutive 24-calendar-month period (the “Incumbent Directors”) cease for any reason other than due to death to constitute at least a majority of the members of the Board; provided that any director whose election, or nomination for election by the Company’s stockholders, was approved or ratified by a vote of at least a majority of the members of the Board then still in office who were members of the Board at the beginning of such 24-calendar-month period, shall be deemed to be an Incumbent Director. Where a Covered Transaction involves a tender offer that is reasonably expected to be followed by a merger described in clause (i) (as determined by the Administrator), the Covered Transaction shall be deemed to have occurred upon consummation of the tender offer. “Compensation Committee” means the Compensation and Management Development Committee of the Board. “Disability,” unless otherwise defined by the Administrator for purposes of the Plan in the instrument evidencing an Award or in a written employment, services or other agreement between the Participant and the Company or a Related Company, means a mental or physical impairment of the Participant that is expected to result in death or that has lasted or is expected to last for a continuous period of 12 months or more and that causes the Participant to be unable to perform his or her material duties for the Company or a Related Company and to be engaged in any substantial gainful activity, in each case as determined by the Company’s chief human resources officer or other person performing that function or, in the case of directors and executive officers, the Compensation Committee, whose determination shall be conclusive and binding. “Effective Date” has the meaning set forth in Section 18. “Eligible Person” means any person eligible to receive an Award as set forth in Section 5. “Entity” means any individual, entity or group (within the meaning of Section 13(d)(3) or Section 14(d)(2) of the Exchange Act). “Exchange Act” means the Securities Exchange Act of 1934, as amended from time to time. “Fair Market Value” means the closing price for the Common Stock on any given date during regular trading, or if not trading on that date, such price on the last preceding date on which the Common Stock was traded, unless determined otherwise by the Administrator using such methods or procedures as it may establish. “Grant Date” means the later of (a) the date on which the Administrator completes the corporate action authorizing the grant of an Award or such later date specified by the Administrator and (b) the date on which all conditions precedent to an Award have been satisfied, provided that conditions to the exercisability or vesting of Awards shall not defer the Grant Date. “Incentive Stock Option” means an Option granted with the intention that it qualify as an “incentive stock option” as that term is defined for purposes of Section 422 of the Code or any successor provision. “Nonqualified Stock Option” means an Option other than an Incentive Stock Option. “Option” means a right to purchase Common Stock granted under Section 7. “Option Expiration Date” means the last day of the maximum term of an Option. “Parent Company” means a company or other entity which as a result of a Covered Transaction owns the Company or all or substantially all of the Company’s assets either directly or through one or more subsidiaries. “Participant” means any Eligible Person to whom an Award is granted. “Performance Award” means an Award of Performance Shares or Performance Units granted under Section 11. “Performance Criteria,” with respect to an Award, means a determinable measure of performance relating to any one or any combination of performance metrics (measured either absolutely or by reference to an index or indices and determined either on a consolidated basis or, as the context permits, on a divisional, subsidiary, line of business, project or geographical basis or in combinations thereof), including, but not limited to, sales; revenues; assets; expenses; earnings before or after deductions for all or any portion of interest, taxes, depreciation, or amortization, whether or not on a continuing operations or an aggregate or per share basis; return on equity, investment, capital or assets; one or more operating ratios; borrowing levels, leverage ratios or credit rating; market share; capital expenditures; cash flow; stock price; stockholder return; sales of particular products or services; customer acquisition or retention; acquisitions and divestitures (in whole or in part); joint ventures and strategic alliances; spin-offs, split-ups, and the like; reorganizations; or recapitalizations, restructurings, financings (issuance of debt or equity) or refinancings. A Performance Criterion and any targets with respect thereto determined by the Administrator need not be based upon an increase, a positive or improved result or avoidance of loss. “Performance Share” means an Award of units denominated in shares of Common Stock granted under Section 11.1. “Performance Unit” means an Award of units denominated in cash or property other than shares of Common Stock granted under Section 11.2. “Plan” means the SMTC Corporation 2019 Incentive Plan, as the same may be amended and restated from time to time. “Prior Plan” has the meaning set forth in Section 4.1(b). “Related Company” means any entity that is directly or indirectly controlled by, in control of or under common control with the Company. “Restricted Stock” means an Award of shares of Common Stock granted under Section 10, the rights of ownership of which are subject to restrictions prescribed by the Administrator. “Restricted Stock Unit” means a Stock Unit subject to restrictions prescribed by the Administrator. “Section 409A” means Section 409A of the Code, including any regulations and other guidance issued thereunder by the Department of the Treasury and/or the Internal Revenue Service. “Securities Act” means the Securities Act of 1933, as amended from time to time. “Stock Appreciation Right” or “SAR” means a right granted under Section 9.1 to receive the excess of the Fair Market Value of a specified number of shares of Common Stock over the grant price. “Stock Award” means an Award of shares of Common Stock granted under Section 10, the rights of ownership of which are not subject to restrictions prescribed by the Administrator. “Stock Unit,” including a Restricted Stock Unit, means an Award denominated in units of Common Stock granted under Section 10. “Substitute Awards” means Awards granted or shares of Common Stock issued by the Company in substitution or exchange for awards previously granted by an Acquired Entity. “Successor Company” means the surviving company, the successor company or Parent Company, as applicable, in connection with a Covered Transaction. “Termination of Service” means a termination of employment or service relationship with the Company or a Related Company for any reason, whether voluntary or involuntary, including by reason of death or Disability. Any question as to whether and when there has been a Termination of Service for the purposes of an Award and the cause of such Termination of Service shall be determined by the Company’s chief human resources officer or other person performing that function or, with respect to directors and executive officers, by the Compensation Committee, whose determination shall be conclusive and binding. Transfer of a Participant’s employment or service relationship between the Company and any Related Company shall not be considered a Termination of Service for purposes of an Award. Unless the Compensation Committee determines otherwise, a Termination of Service shall be deemed to occur if the Participant’s employment or service relationship is with an entity that has ceased to be a Related Company. A Participant’s change in status from an employee of the Company or a Related Company to a nonemployee director, consultant, advisor, or independent contractor of the Company or a Related Company, or a change in status from a nonemployee director, consultant, advisor or independent contractor of the Company or a Related Company to an employee of the Company or a Related Company, shall not be considered a Termination of Service. “Vesting Commencement Date” means the Grant Date or such other date selected by the Administrator as the date from which an Award begins to vest.